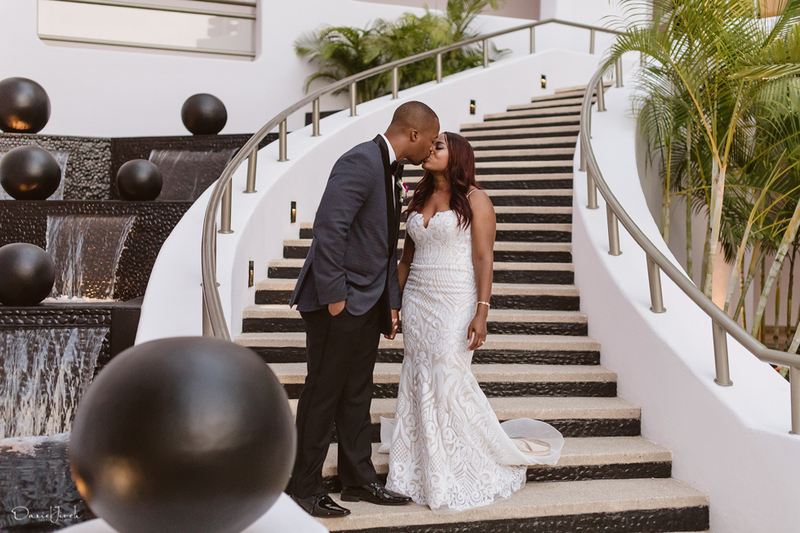 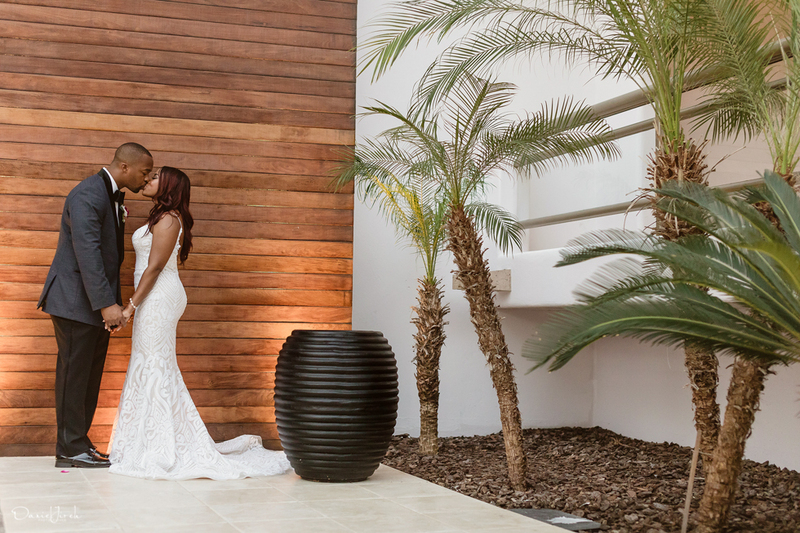 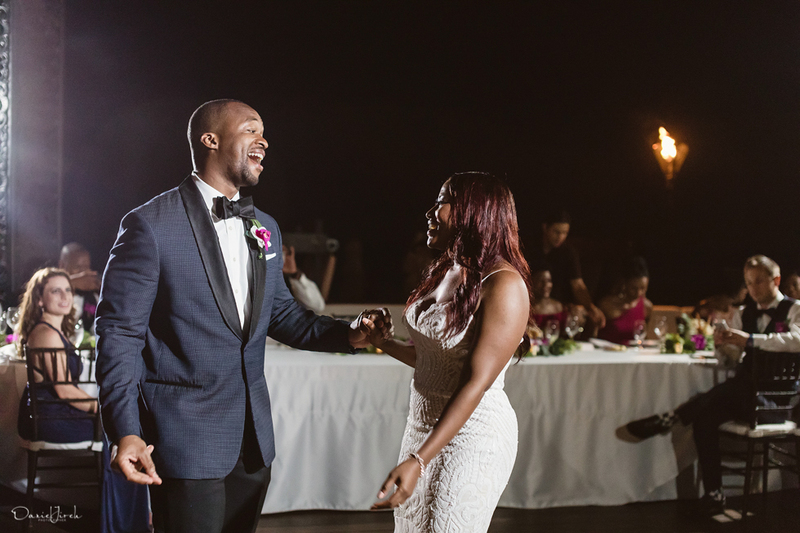 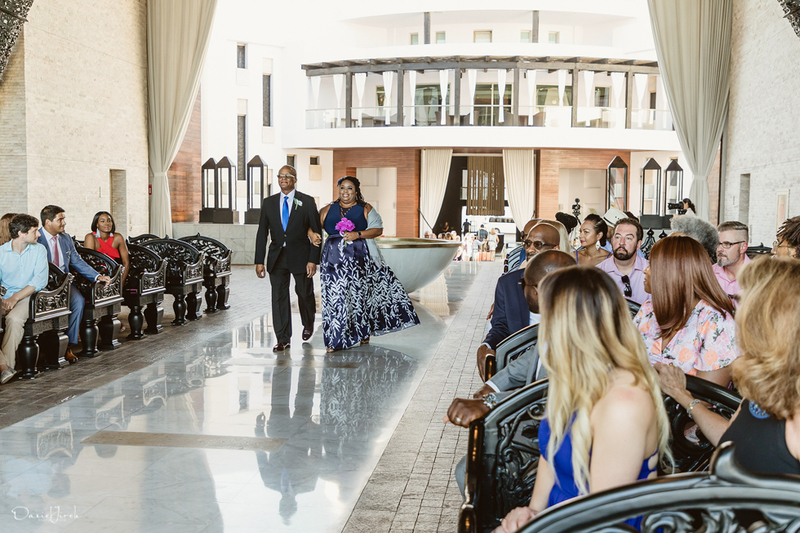 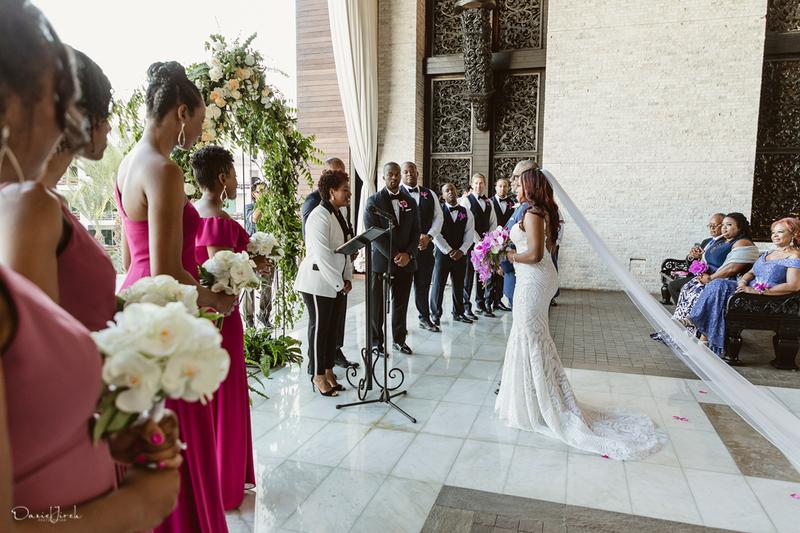 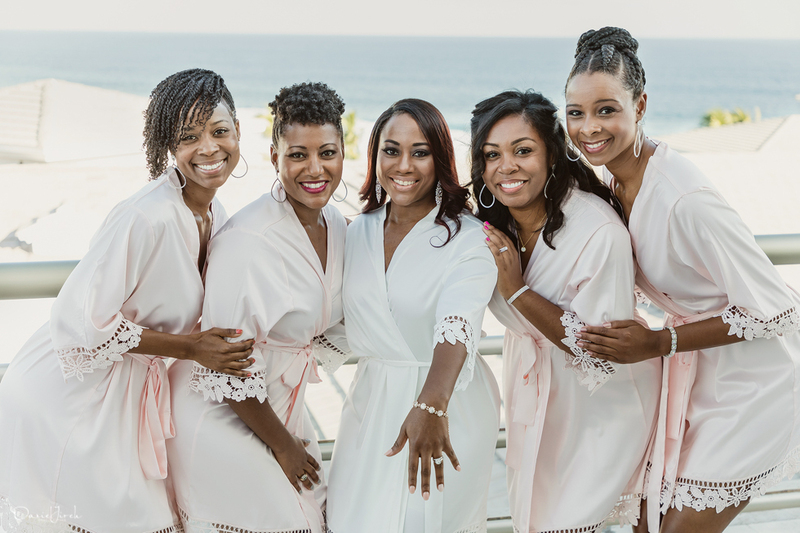 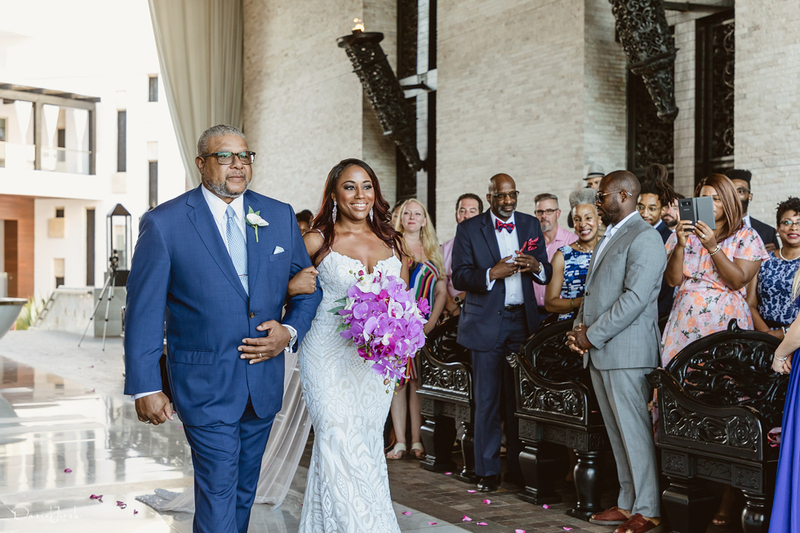 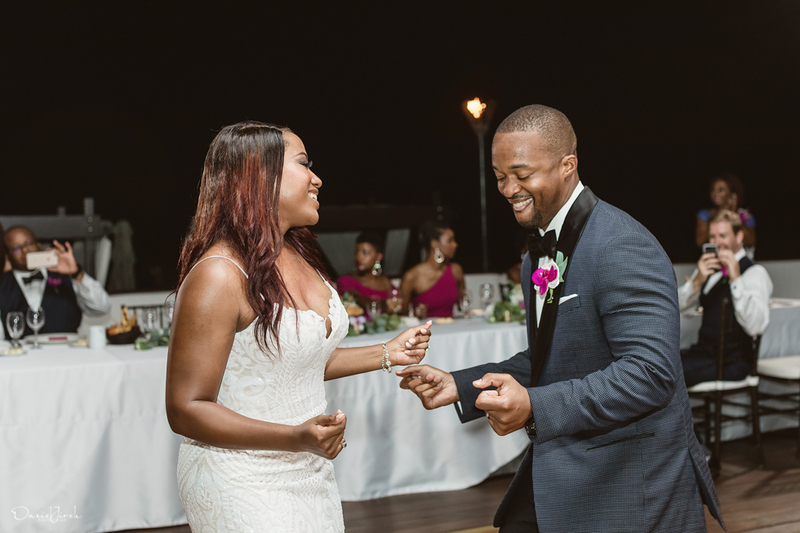 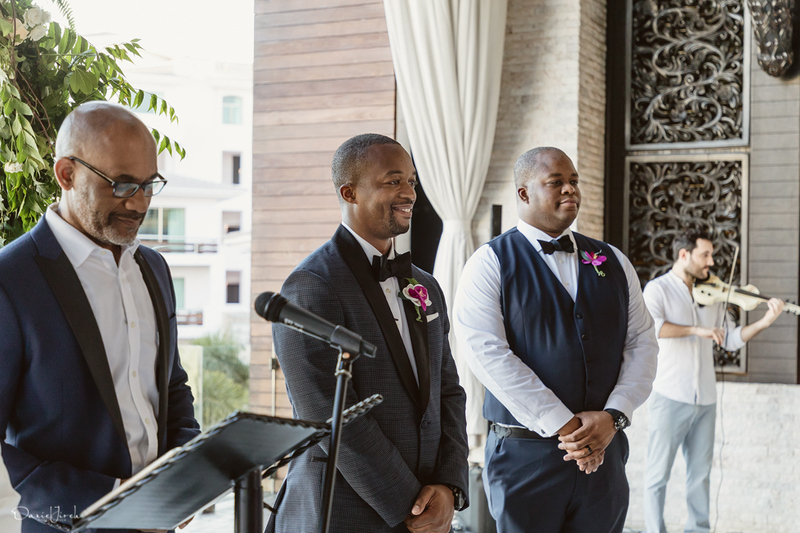 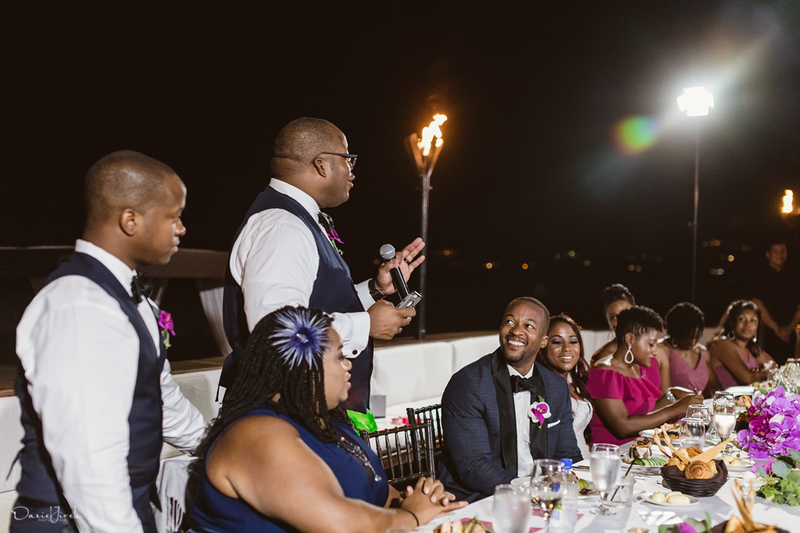 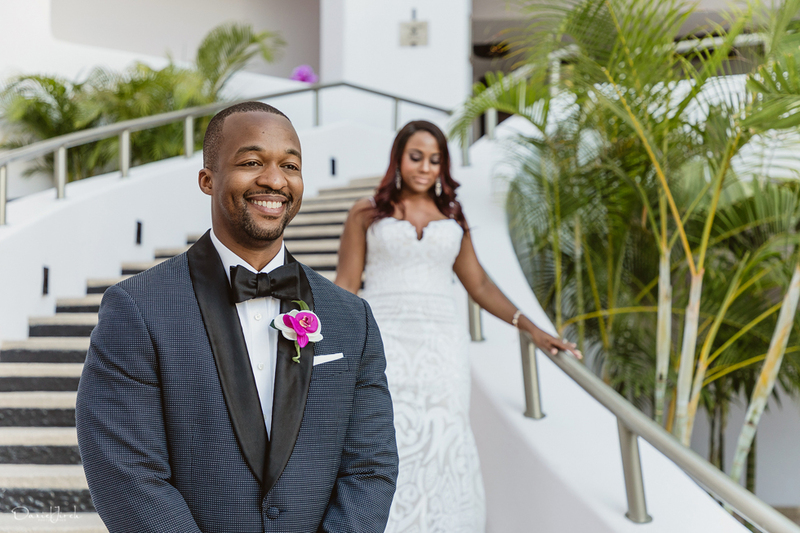 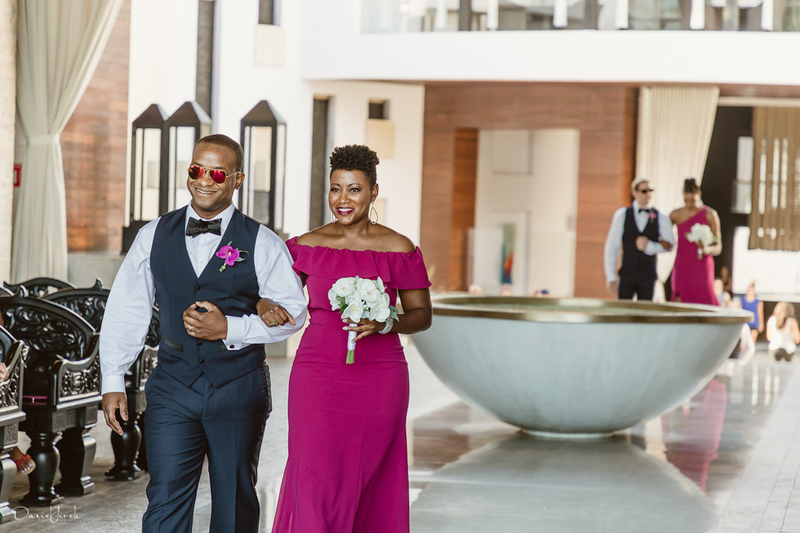 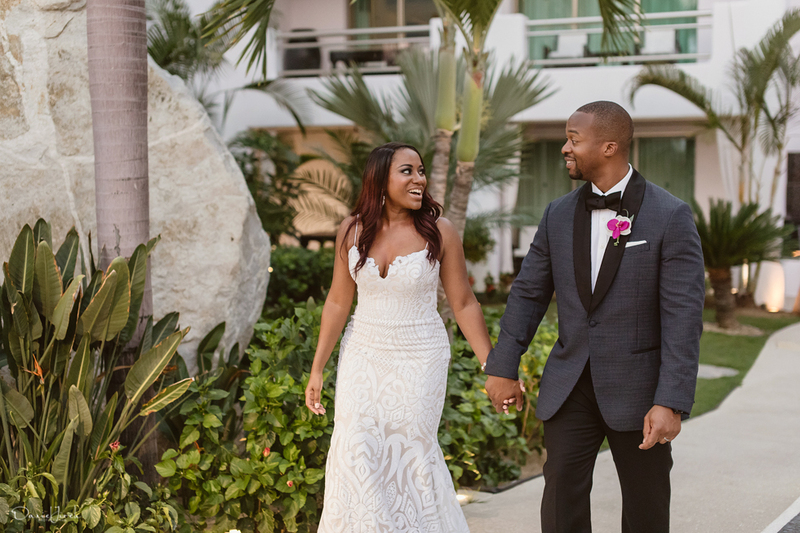 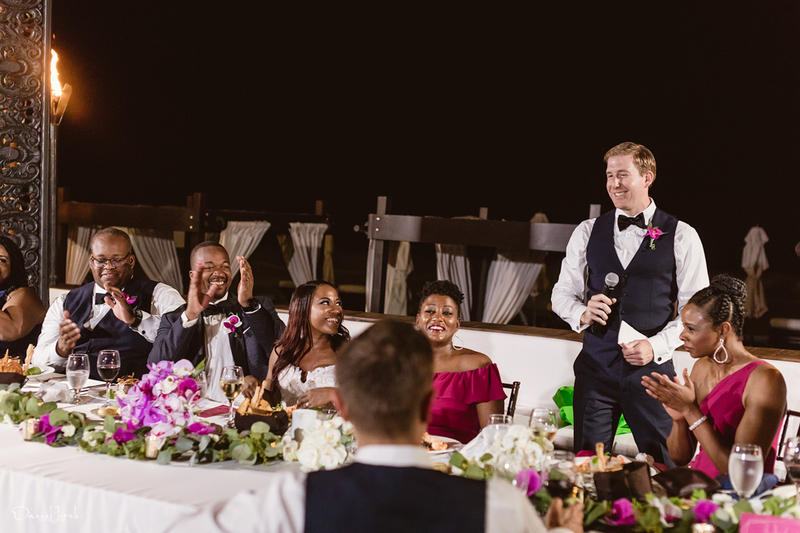 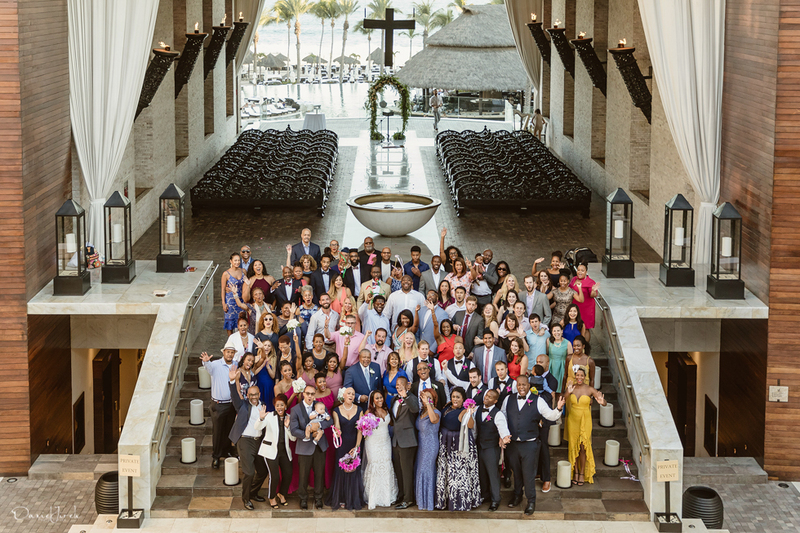 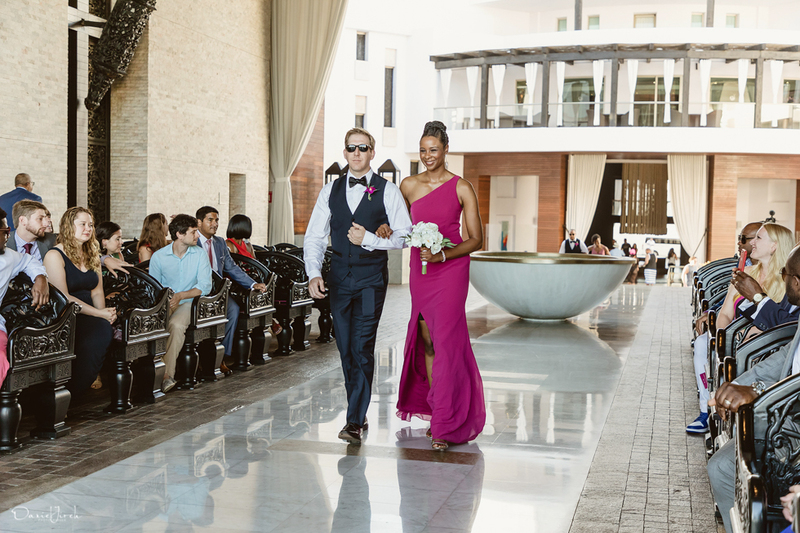 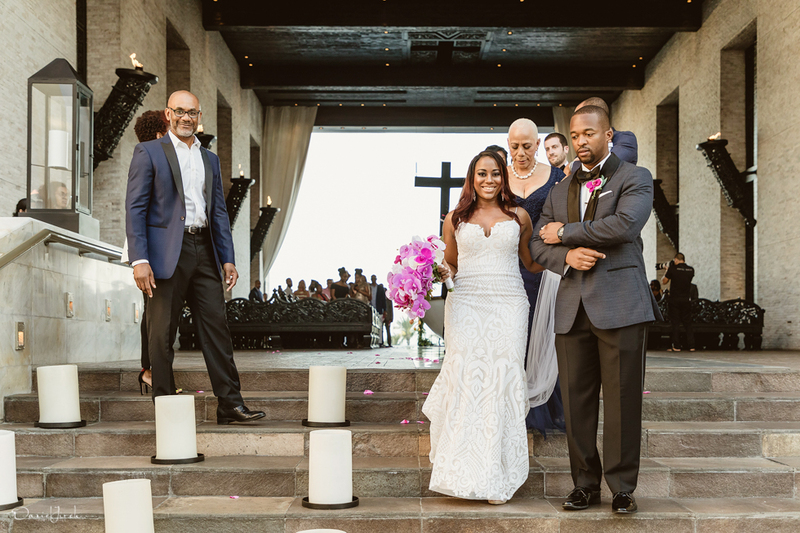 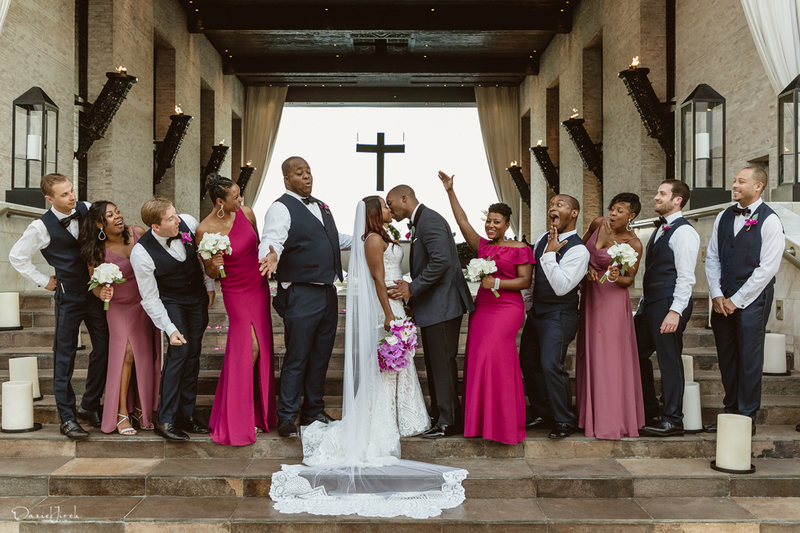 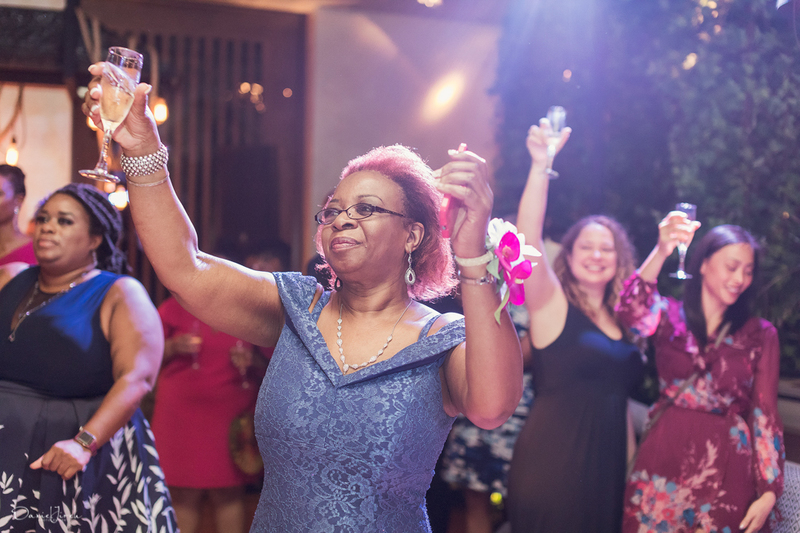 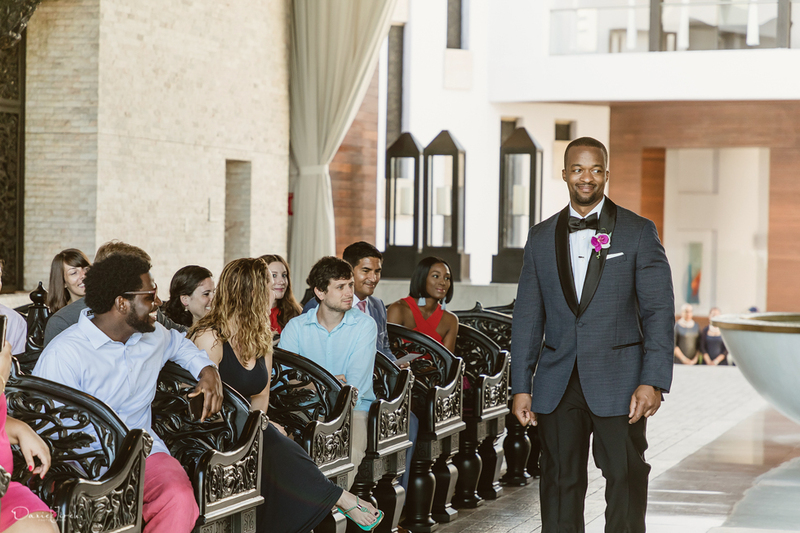 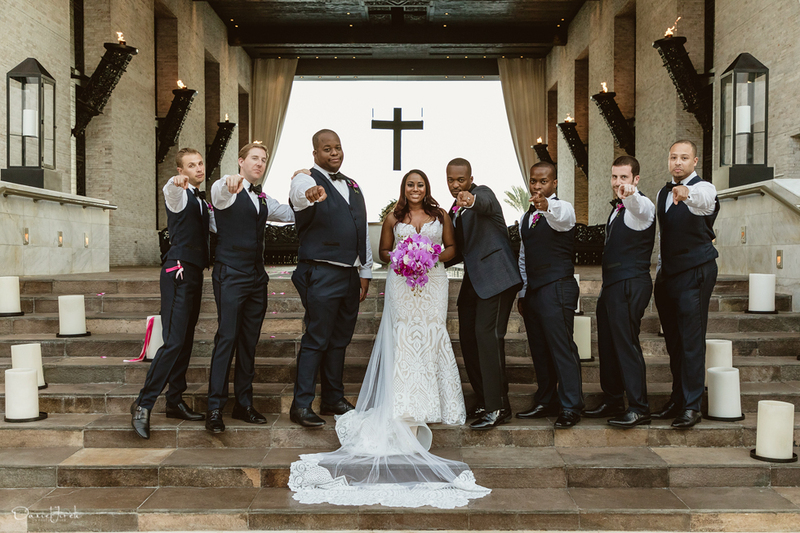 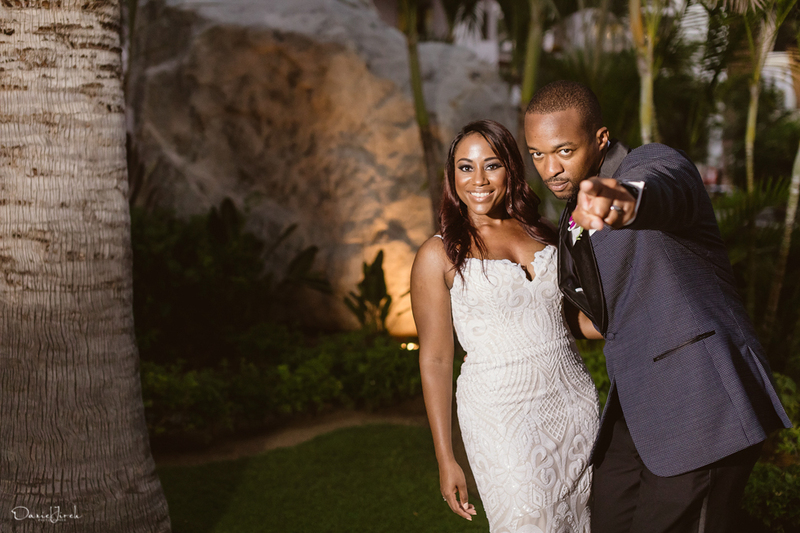 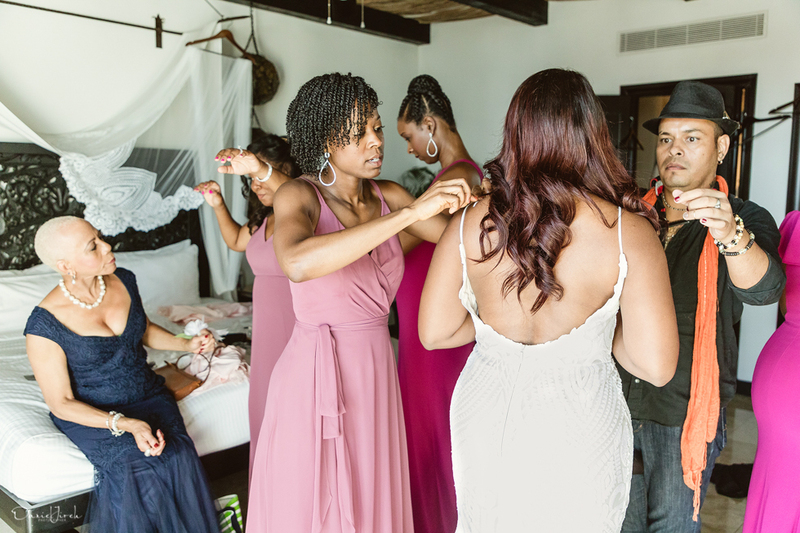 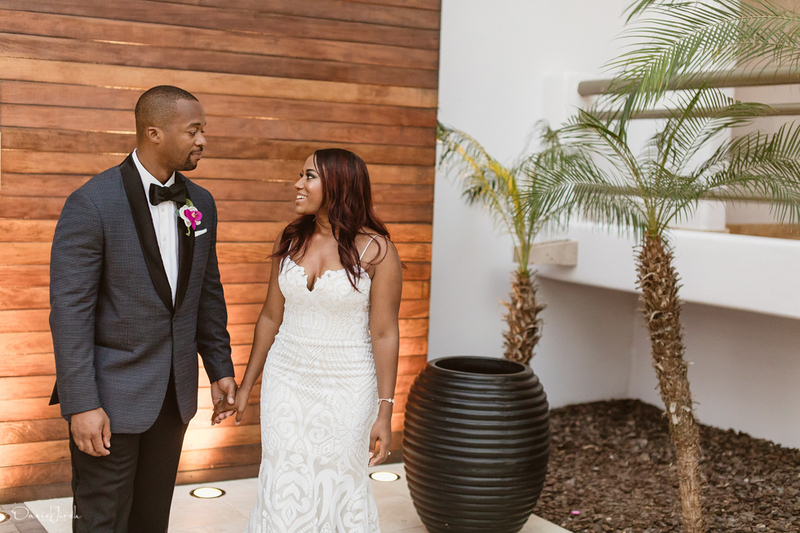 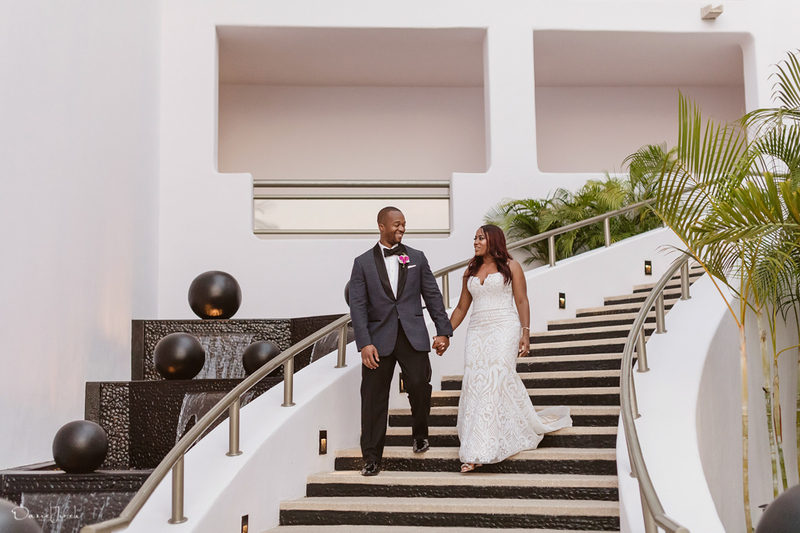 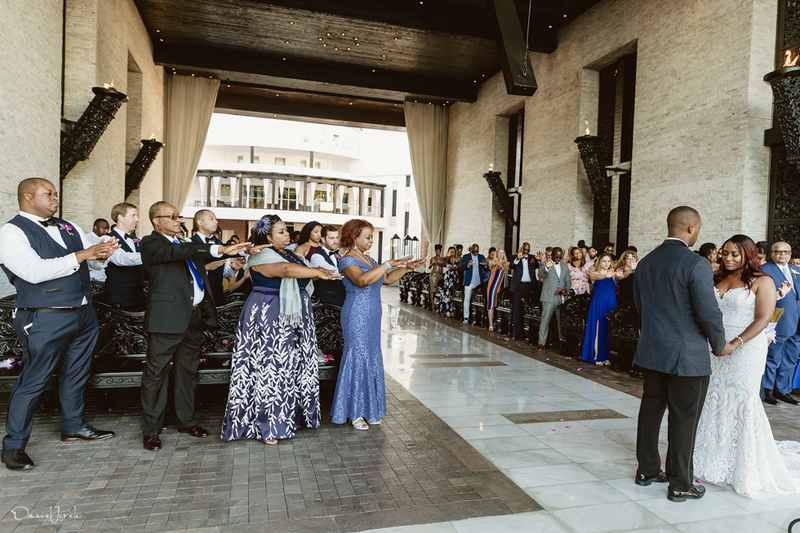 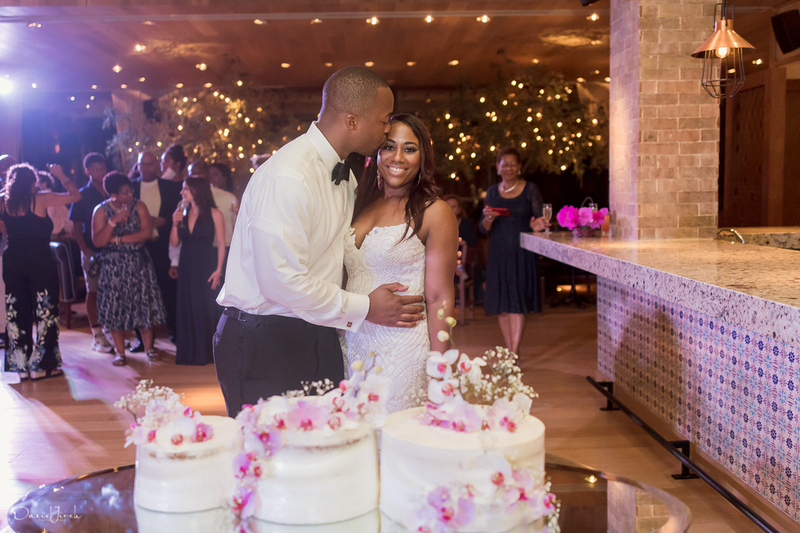 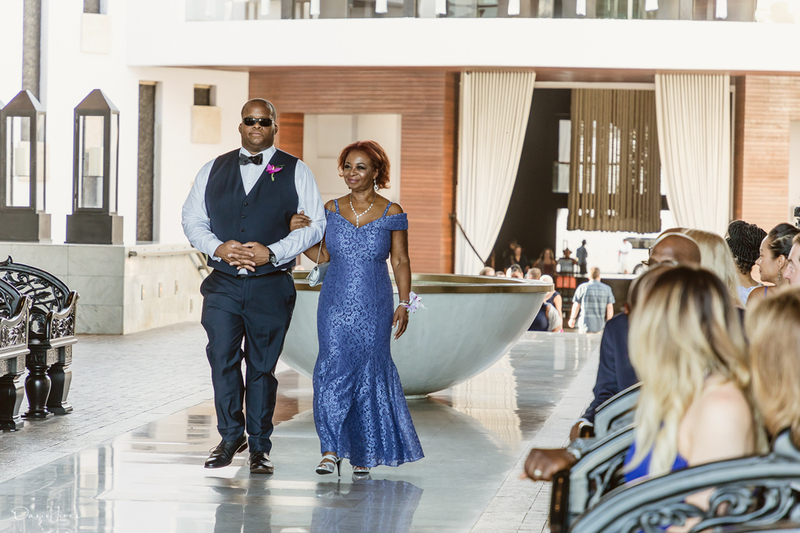 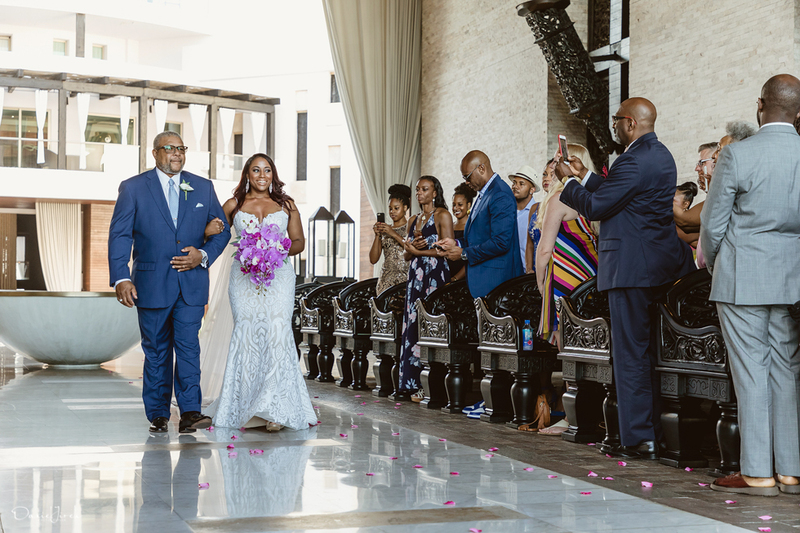 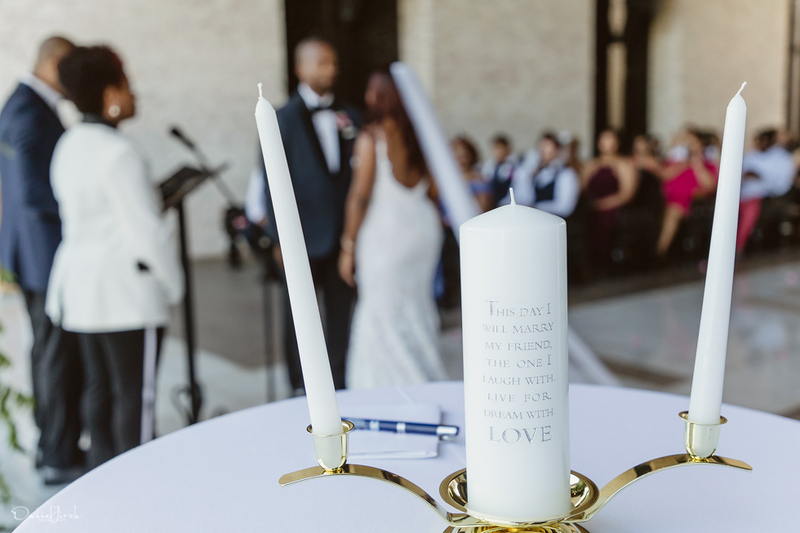 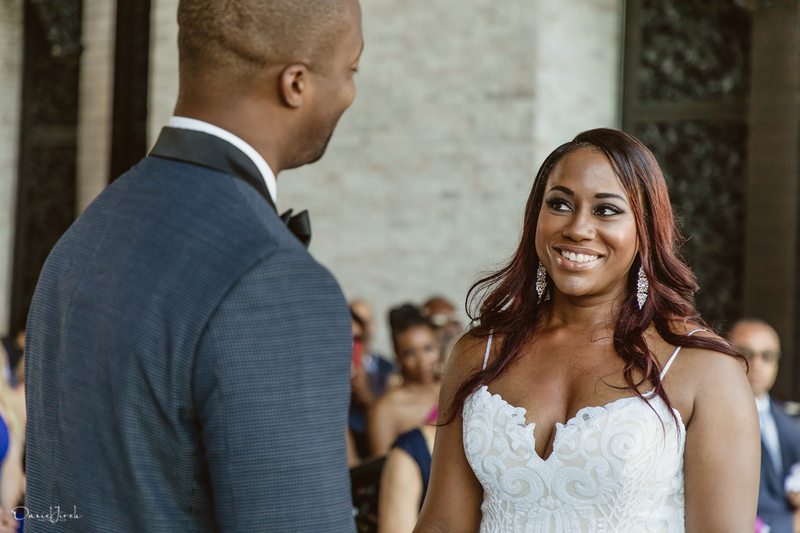 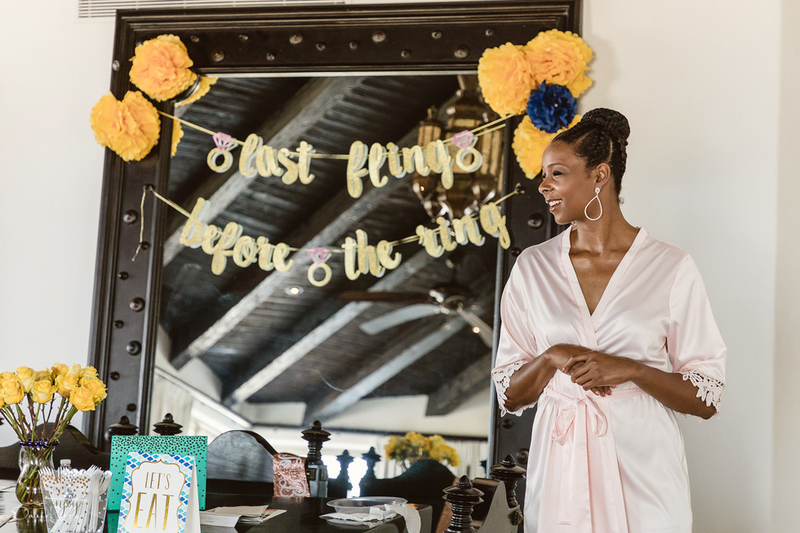 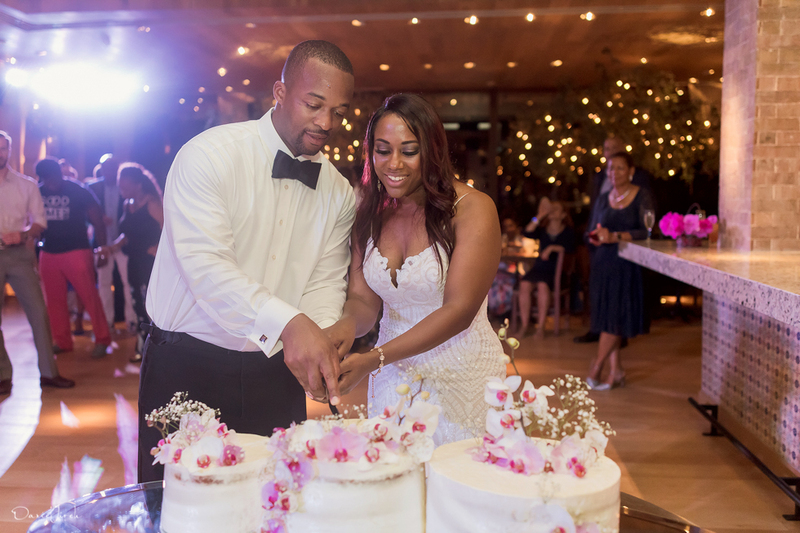 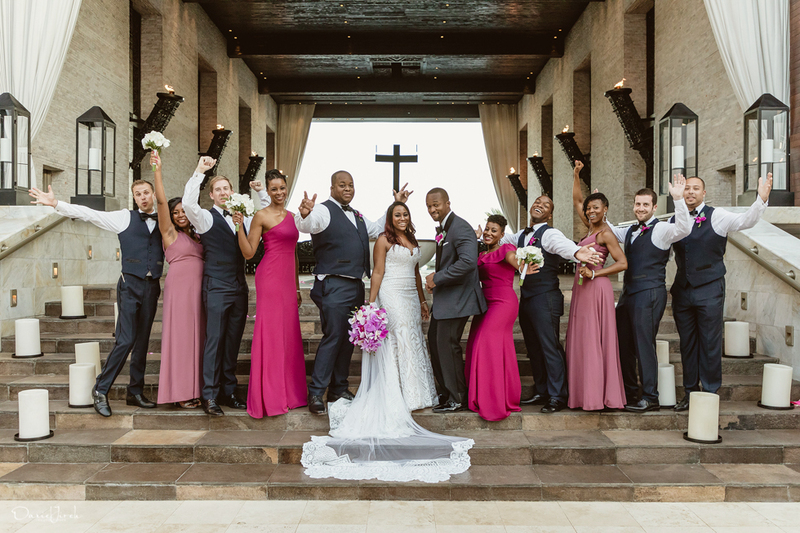 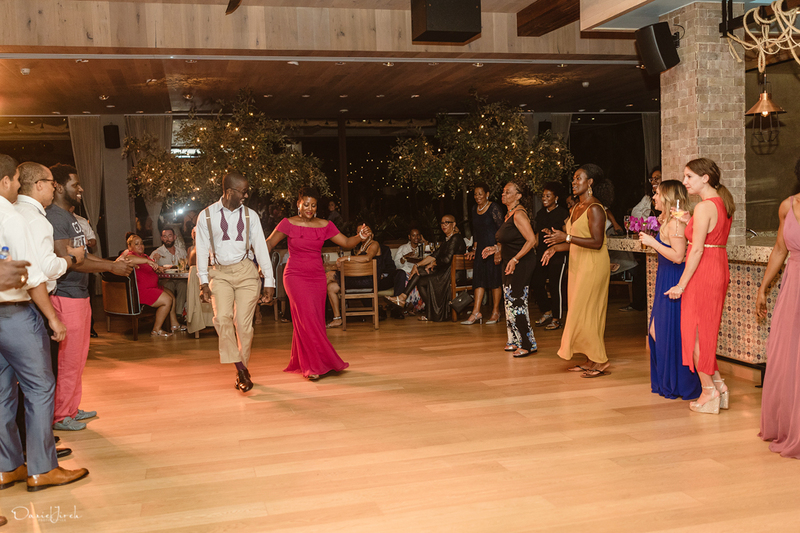 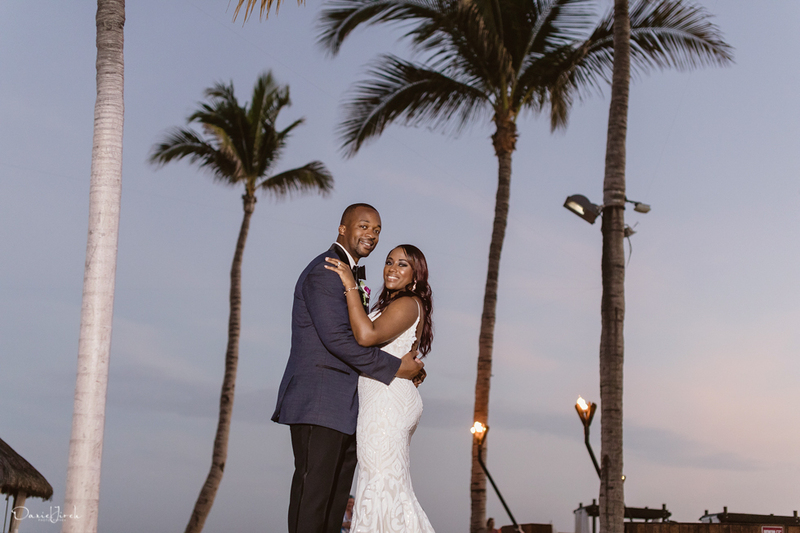 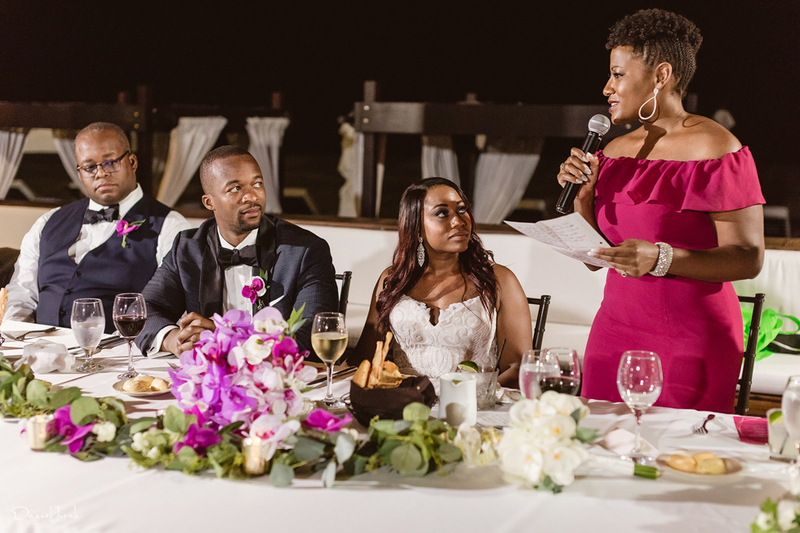 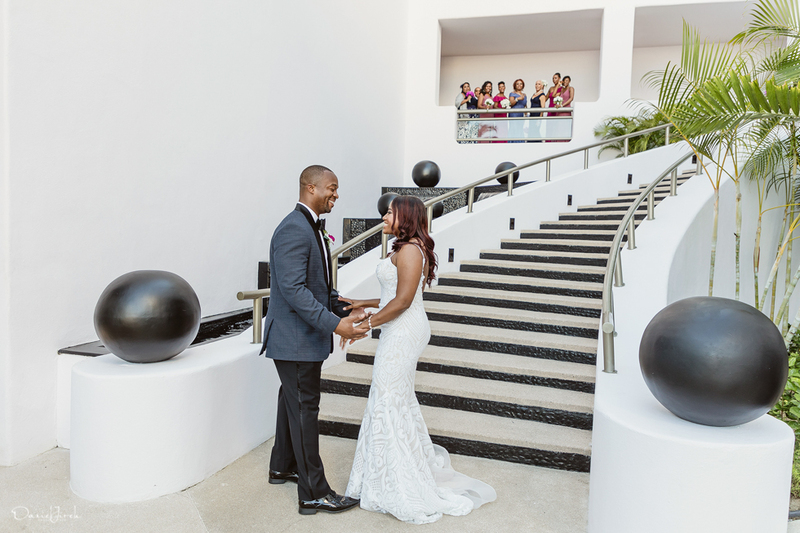 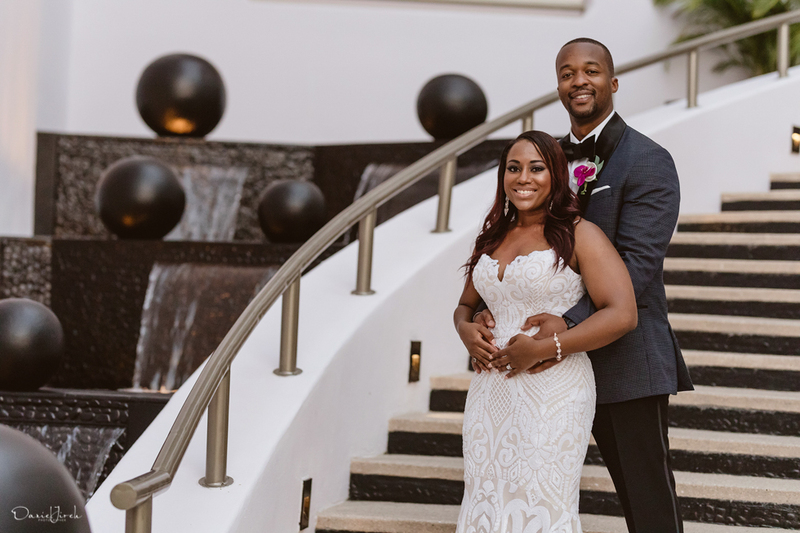 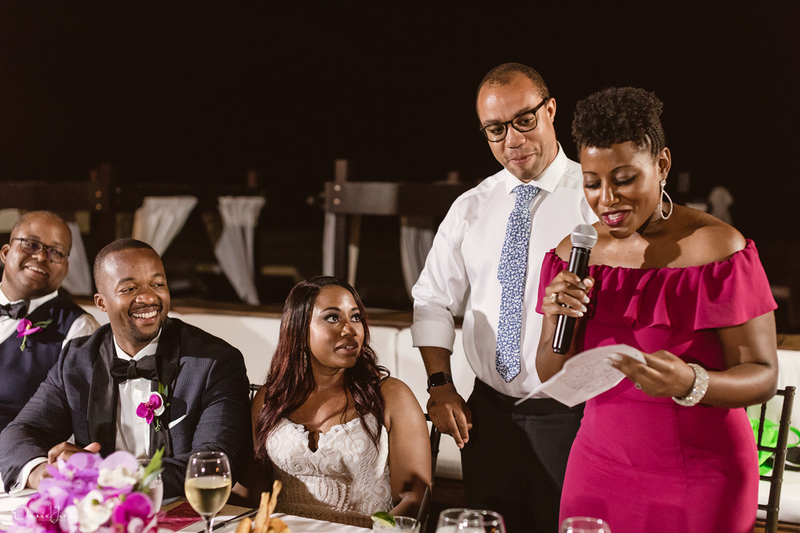 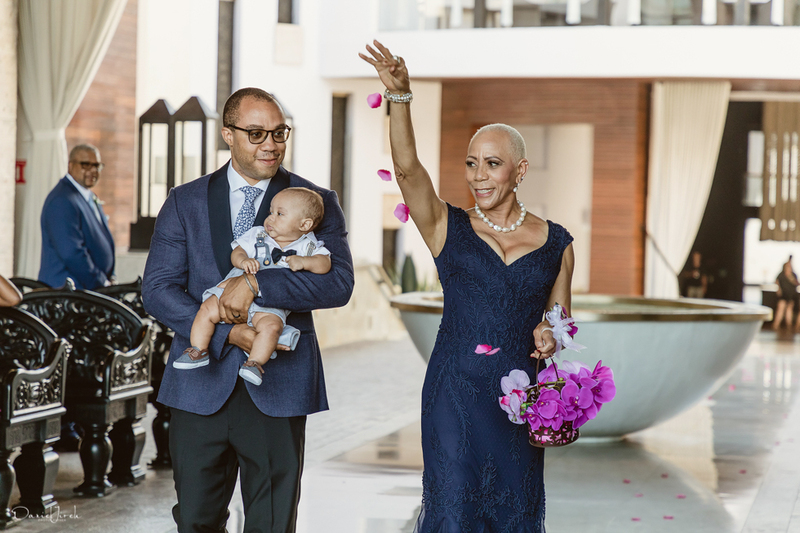 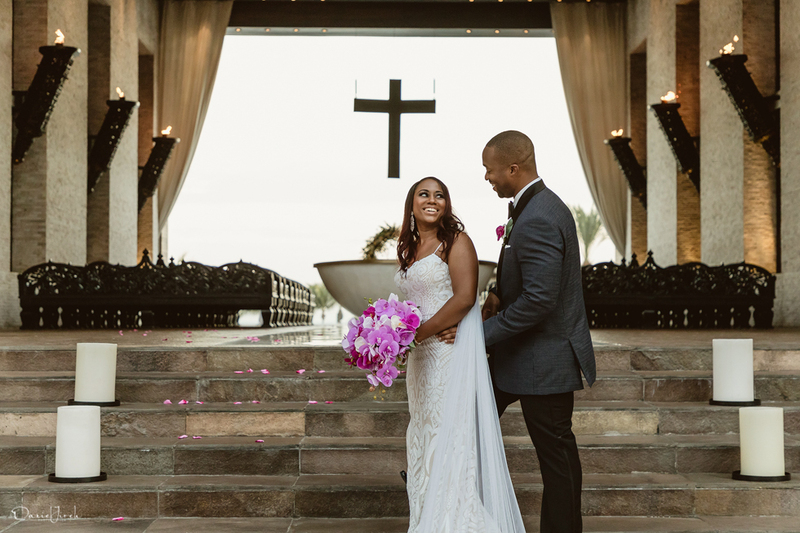 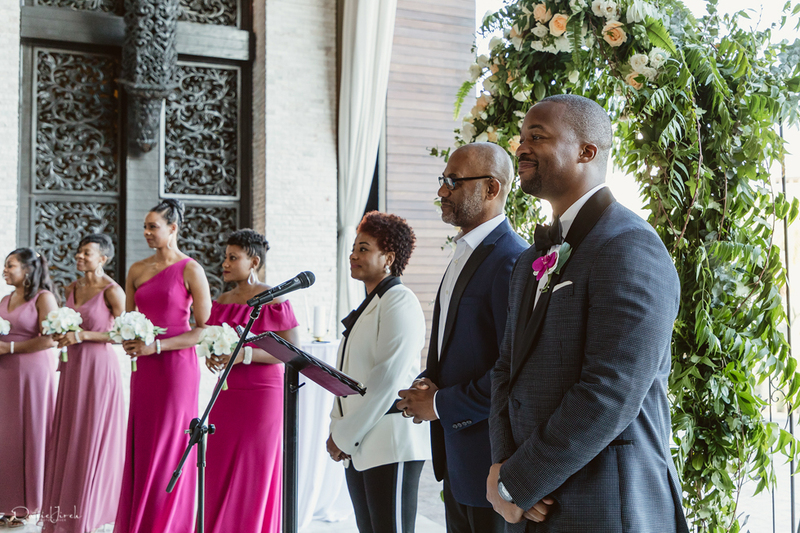 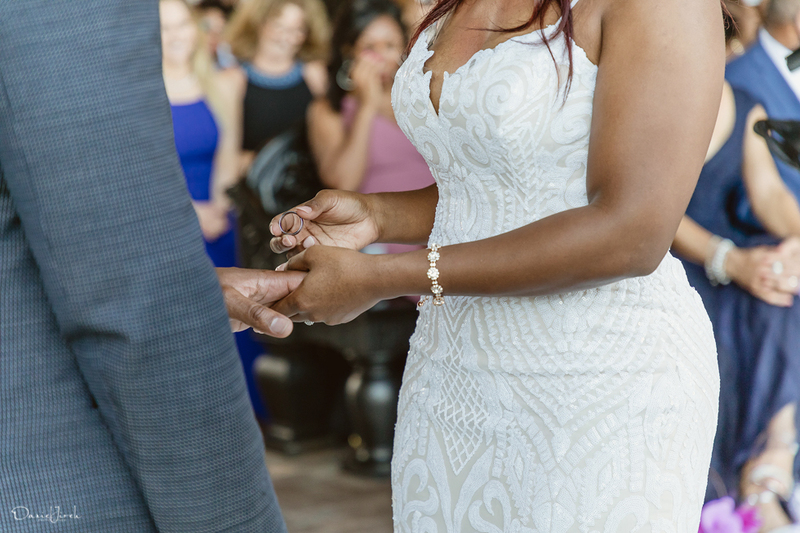 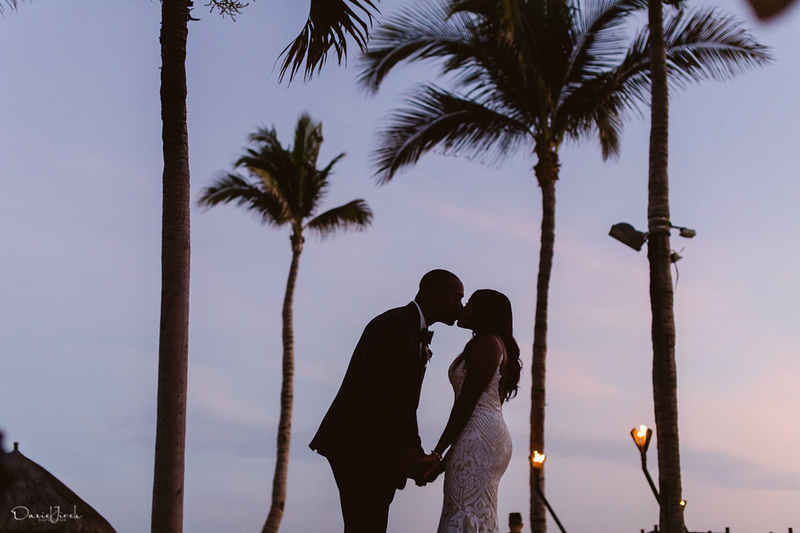 They say beauty is in the eye of the beholder, but whether you favor subdued and subtle or all-out bling, there is no denying that Natalie and Brian’s Los Cabos destination wedding was spectacular! 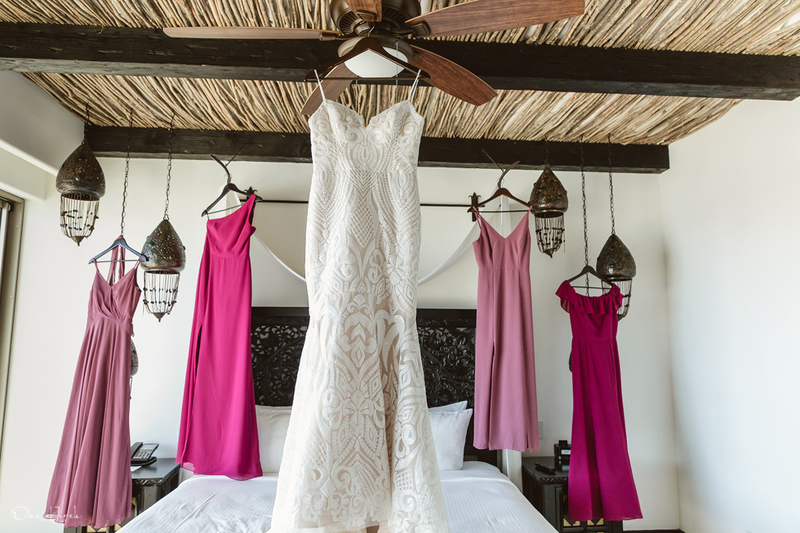 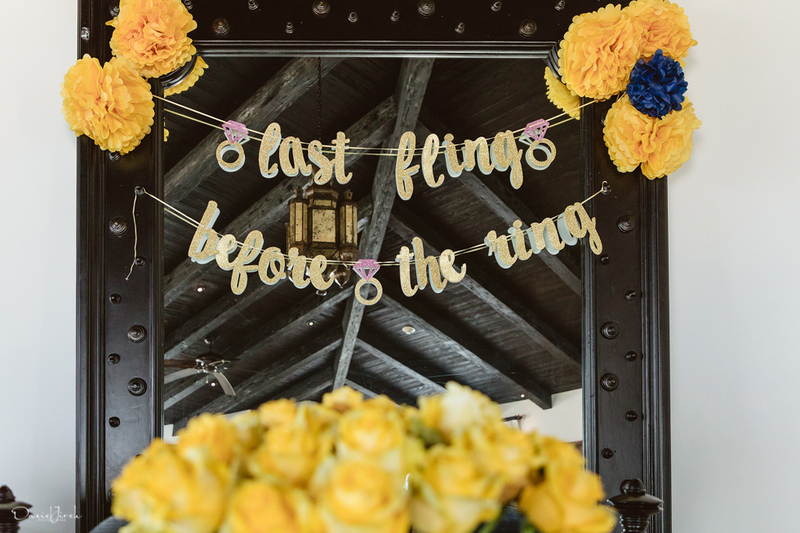 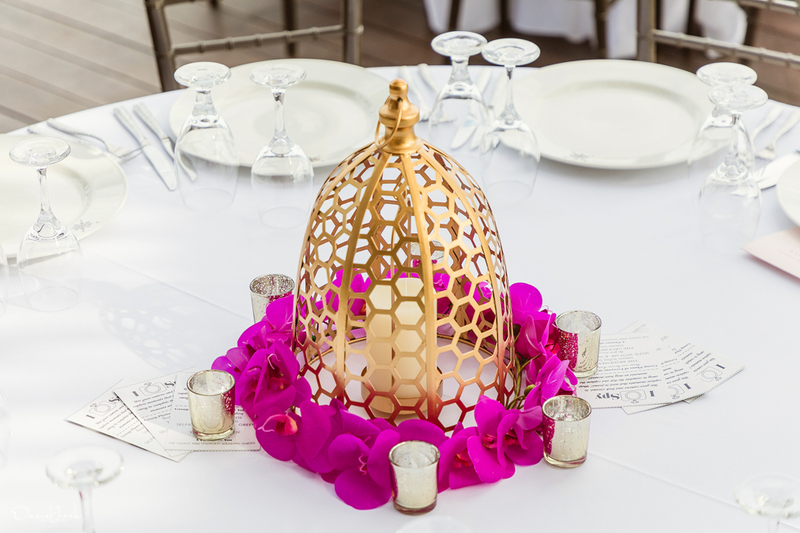 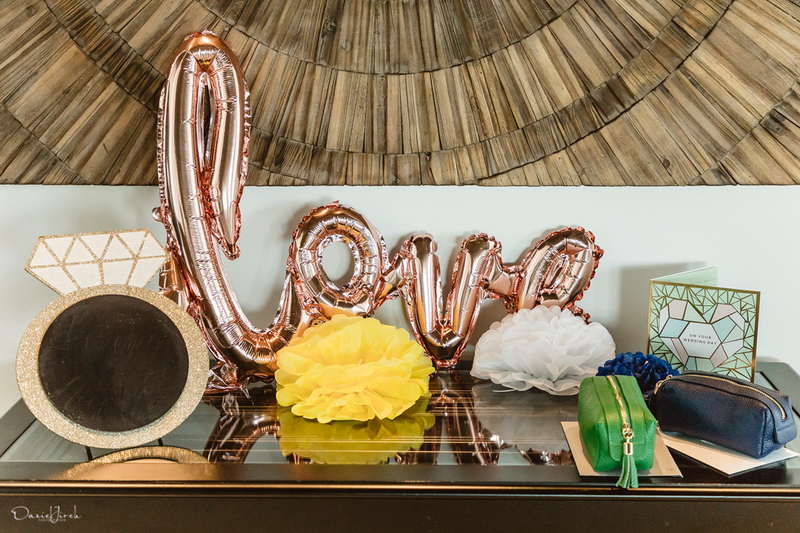 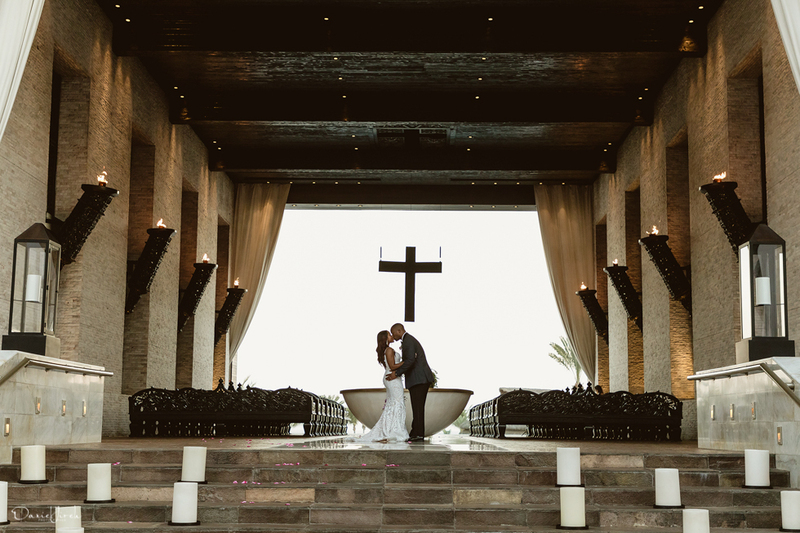 Just the right combination of Pinterest worthy glamour, celebratory kitsch and memorable detail, this once in a lifetime affair transpired at Cabo Azul Resort, a breathtaking contemporary property located on the sparkling Sea of Cortez in San Jose del Cabo. 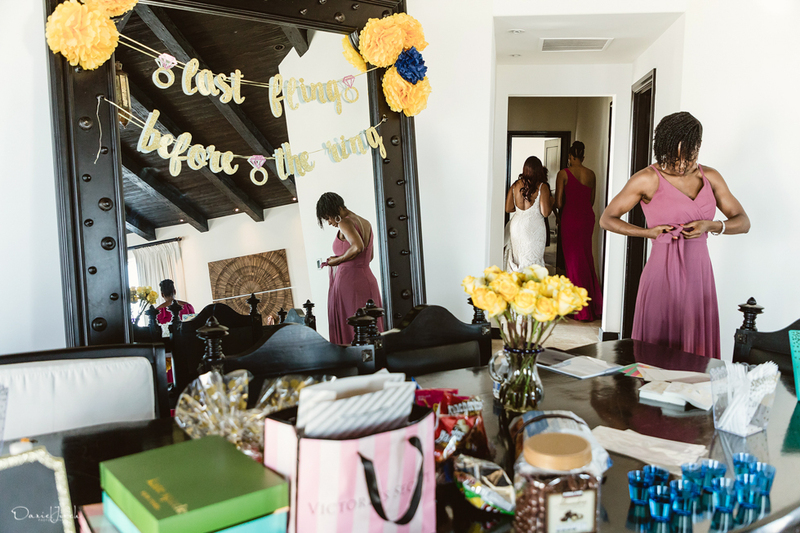 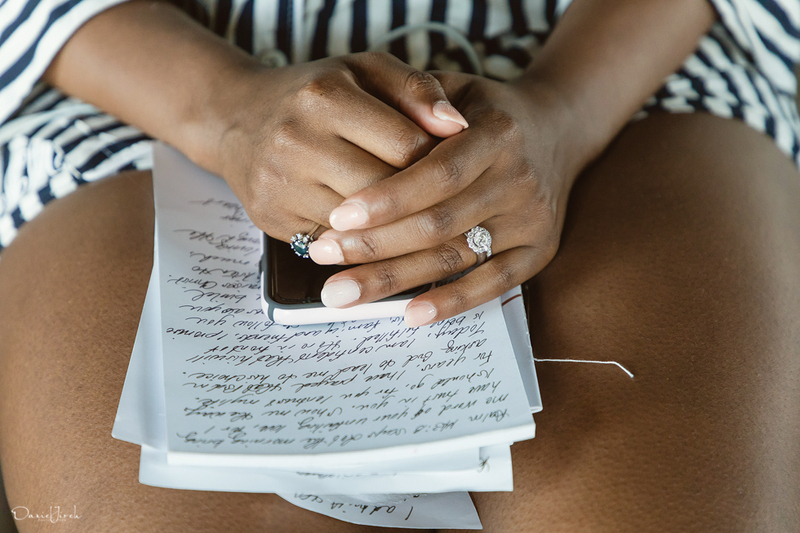 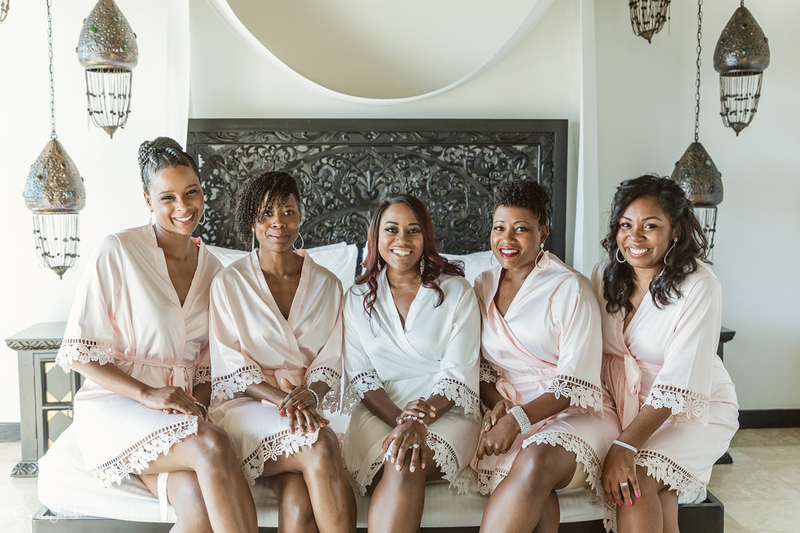 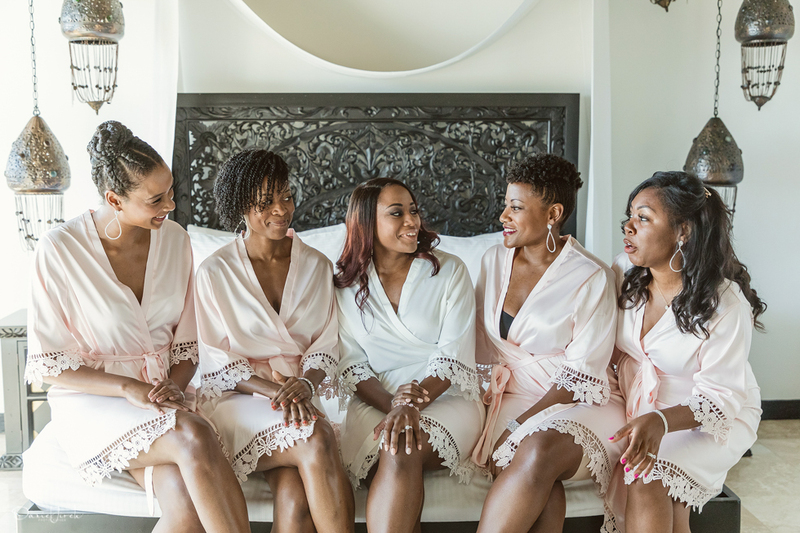 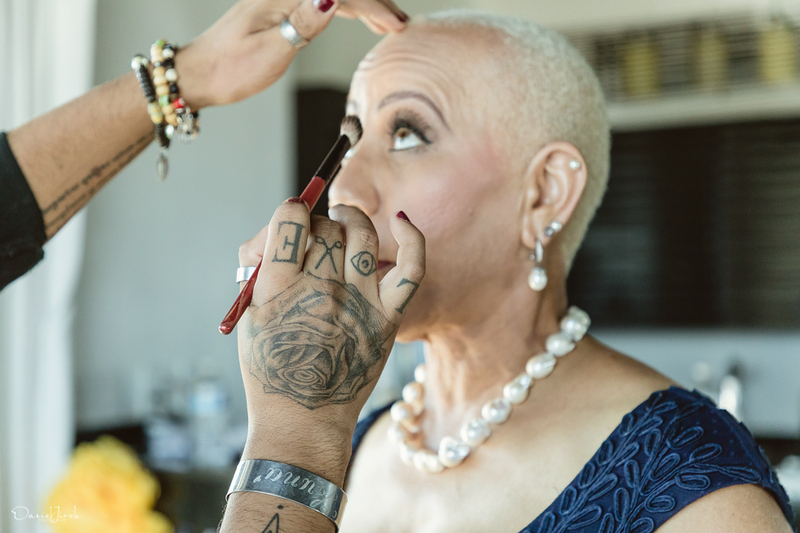 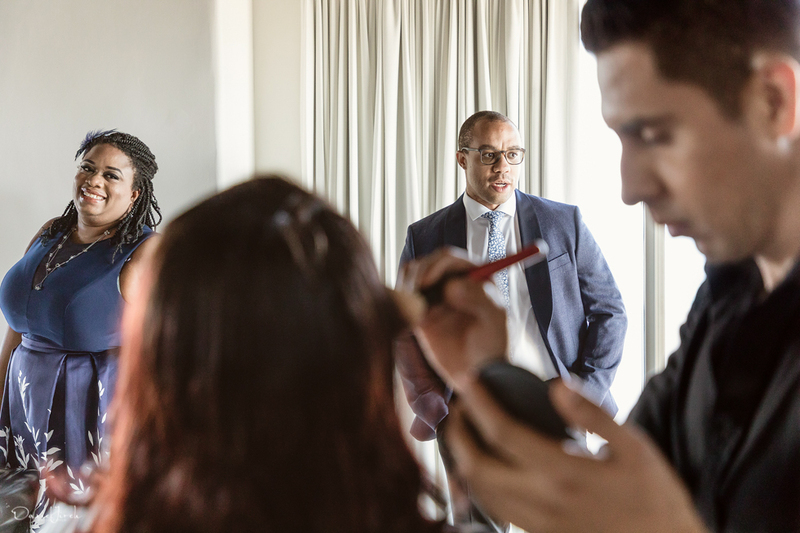 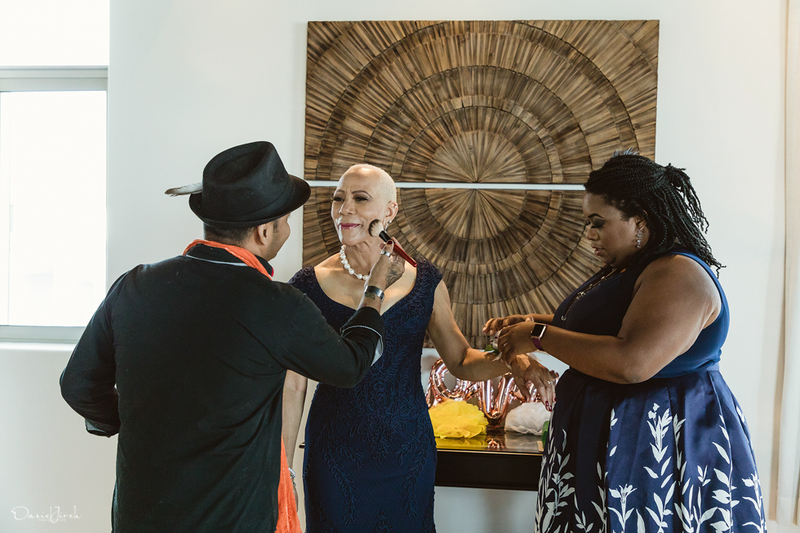 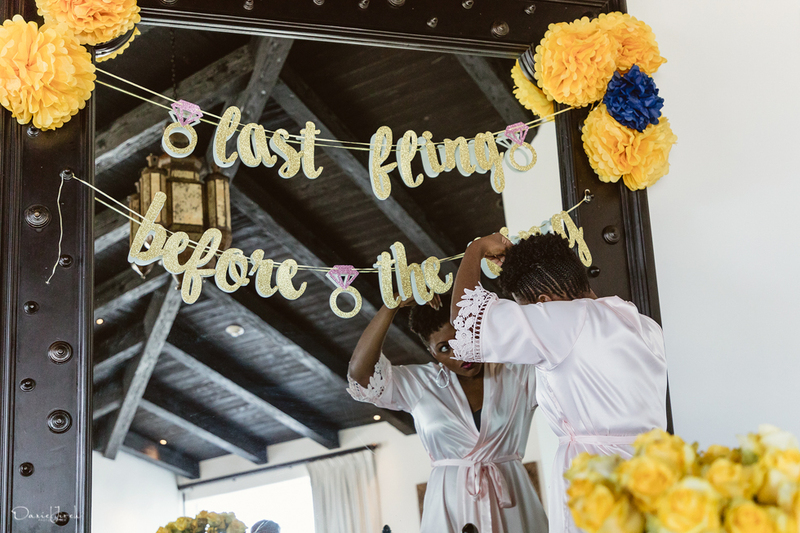 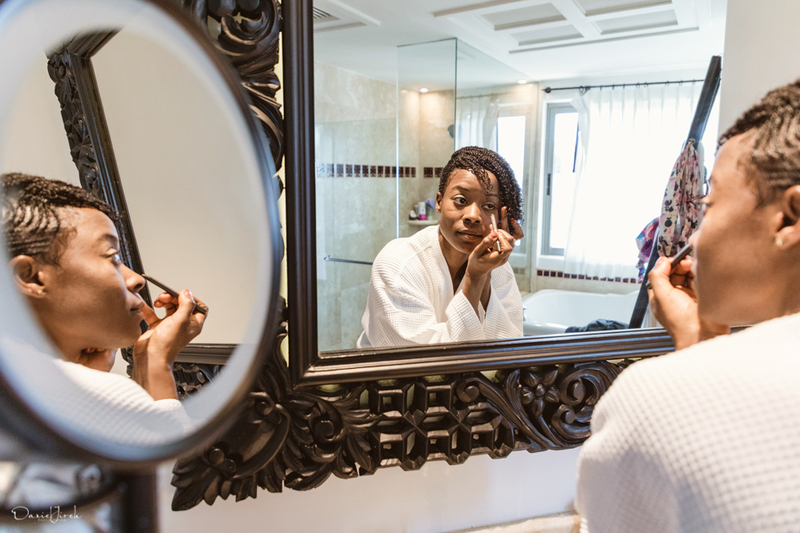 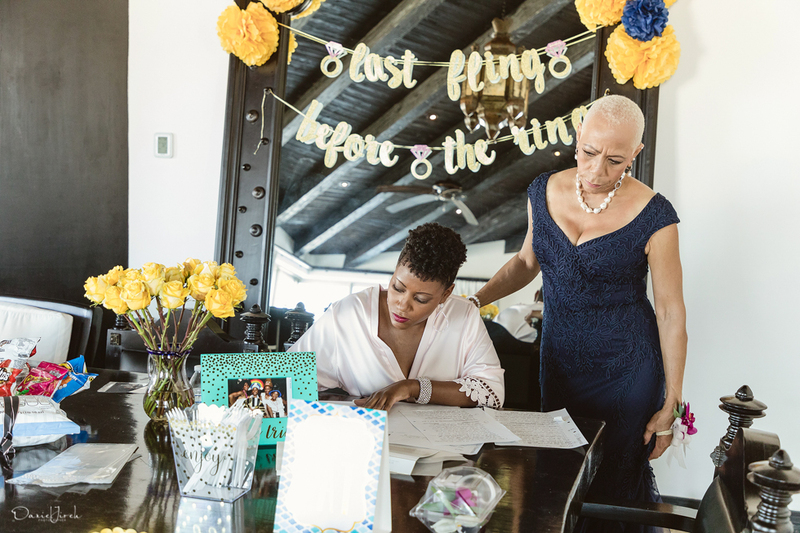 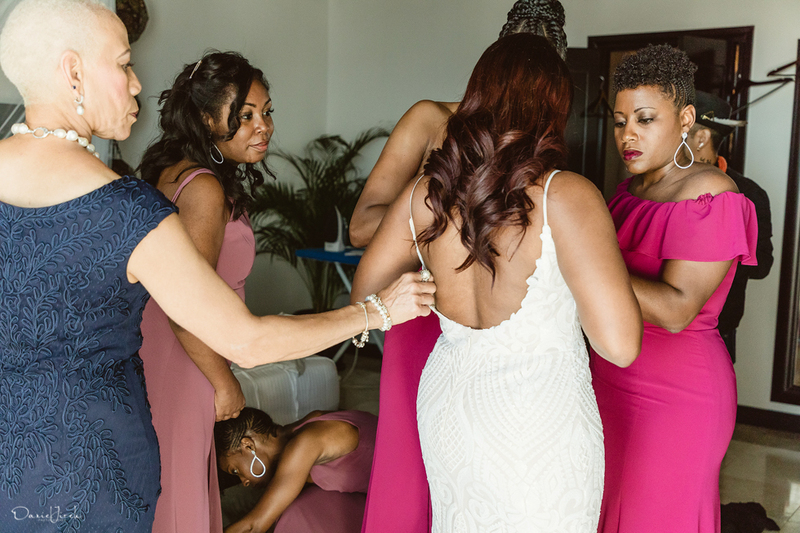 We got clicking as Natalie and her girls put the finishing touches on their wedding day looks in the comfort of the bride’s luxurious and spacious suite. 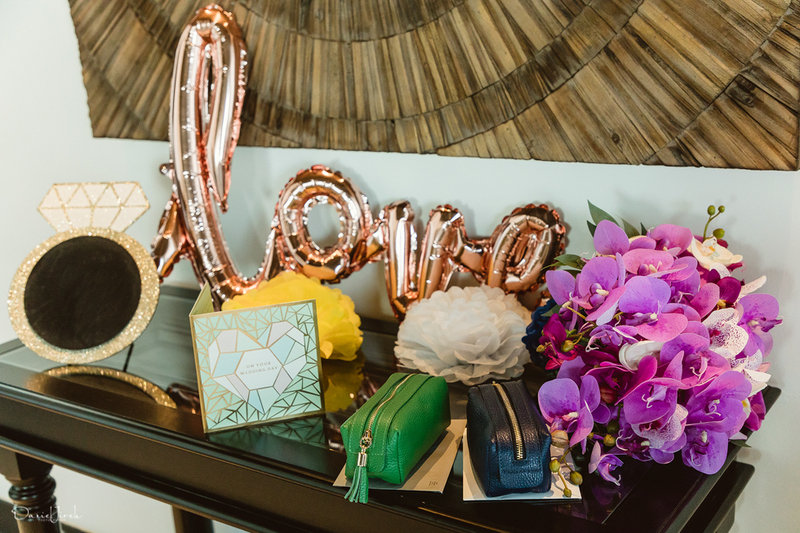 While Paz Spa wielded the brushes and beauty products, Natalie’s designer eye had drafted a color palette to die for, with bright, eye-popping fuchsia the star of the show. 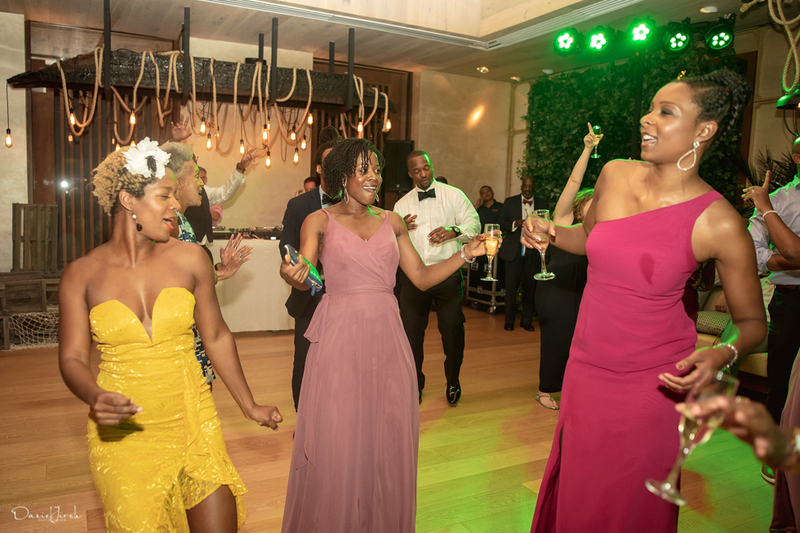 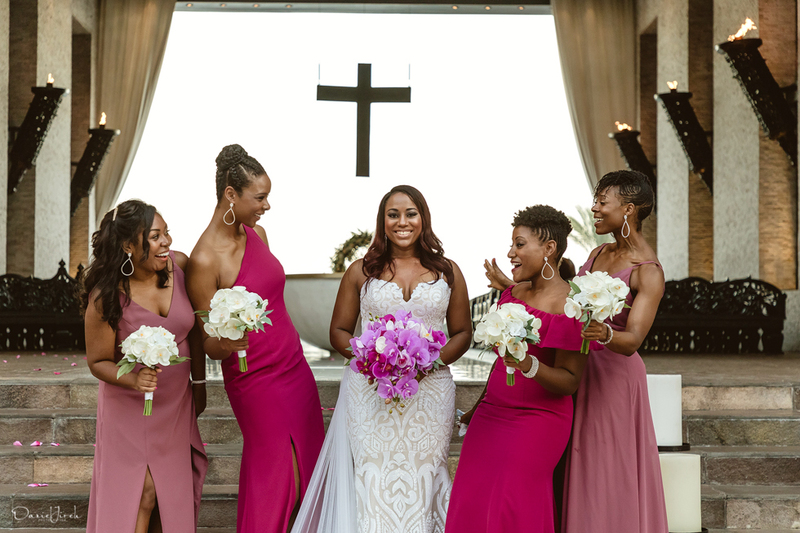 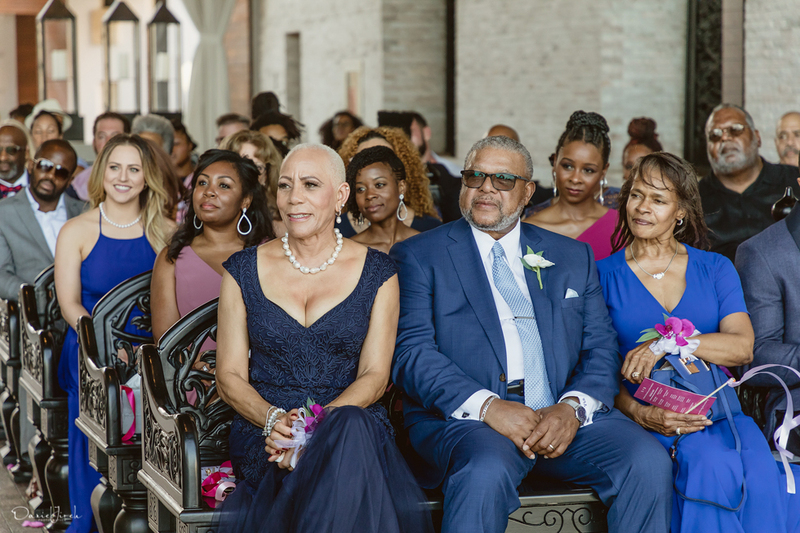 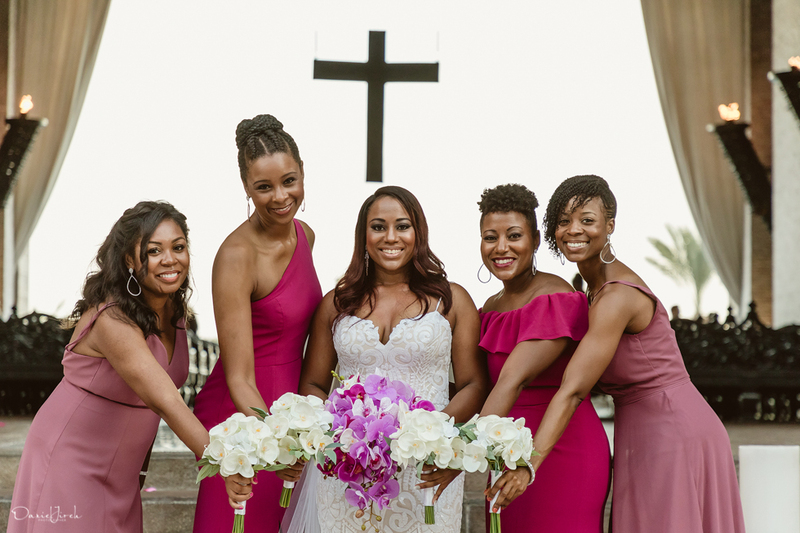 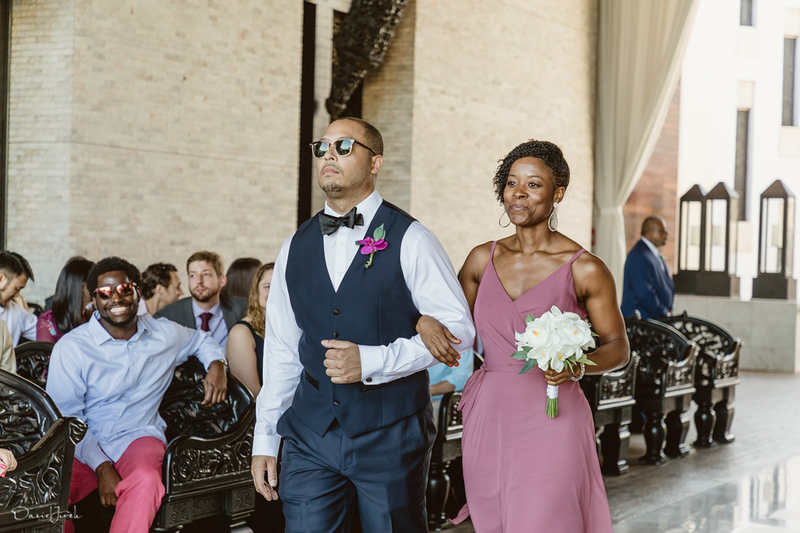 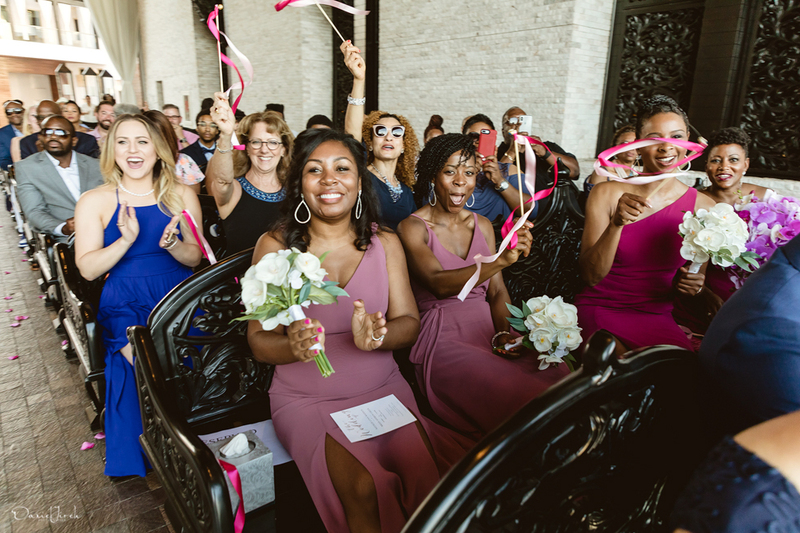 Her four stunning bridesmaid’s donned shades of the same fuchsia and dusty pink, each with a slightly different dress cut to keep things creative. 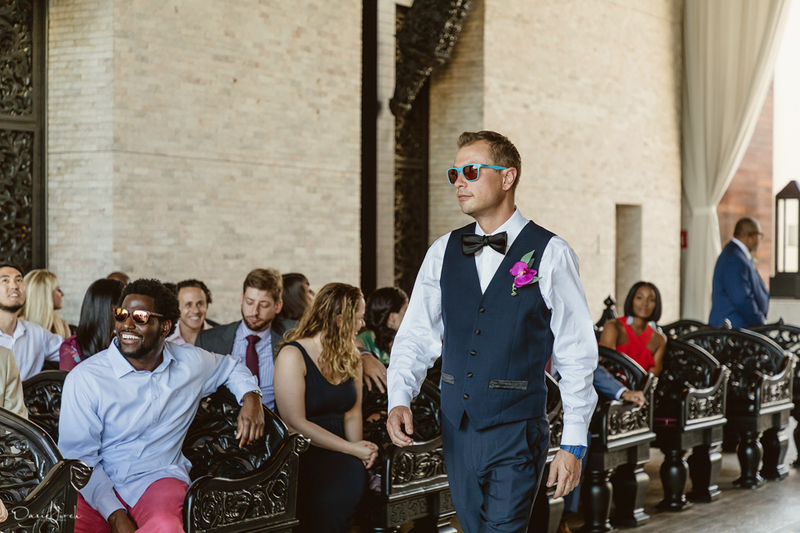 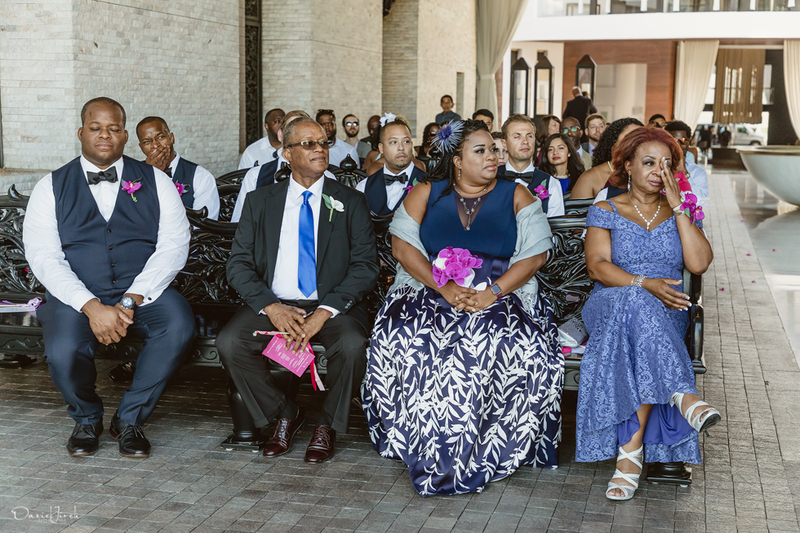 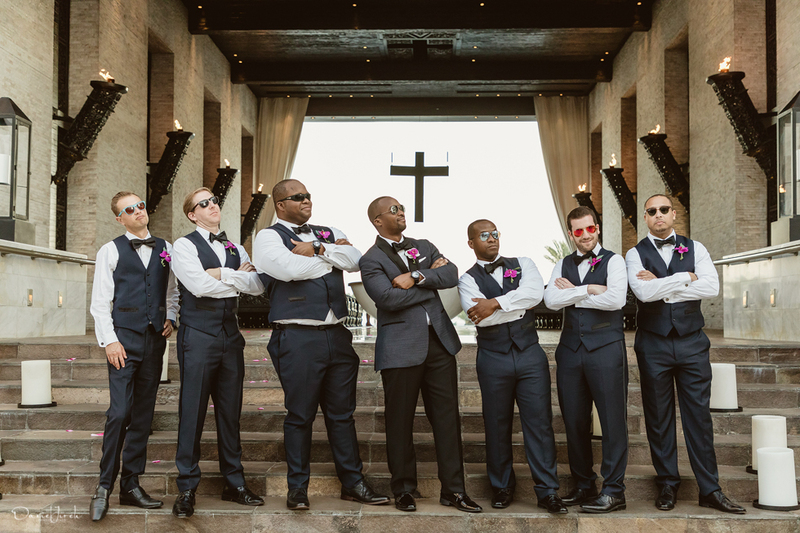 Not to be outshone by Natalie’s crew, Brian’s boys provided a bold contrast in dapper blue suits, upping the cool factor by keeping their shades on come ceremony time. 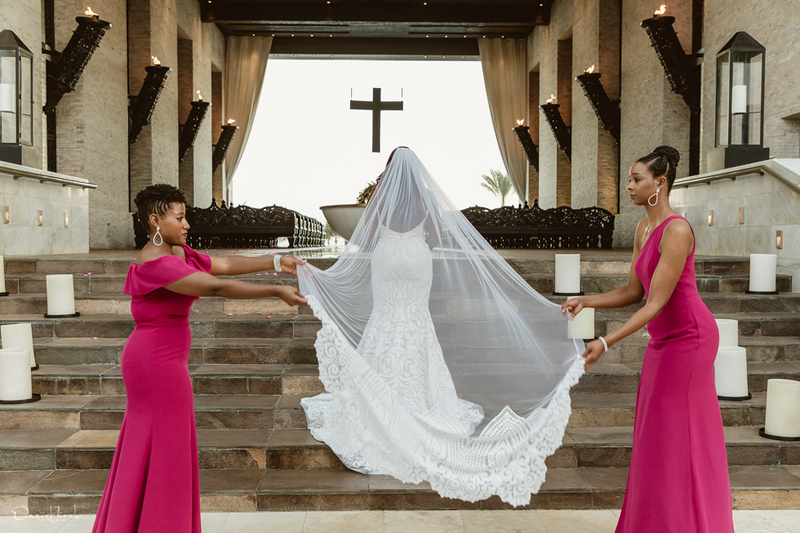 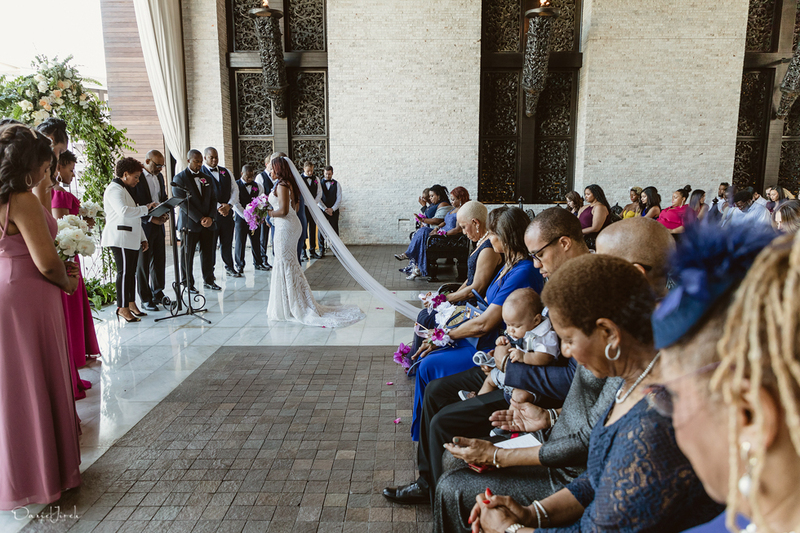 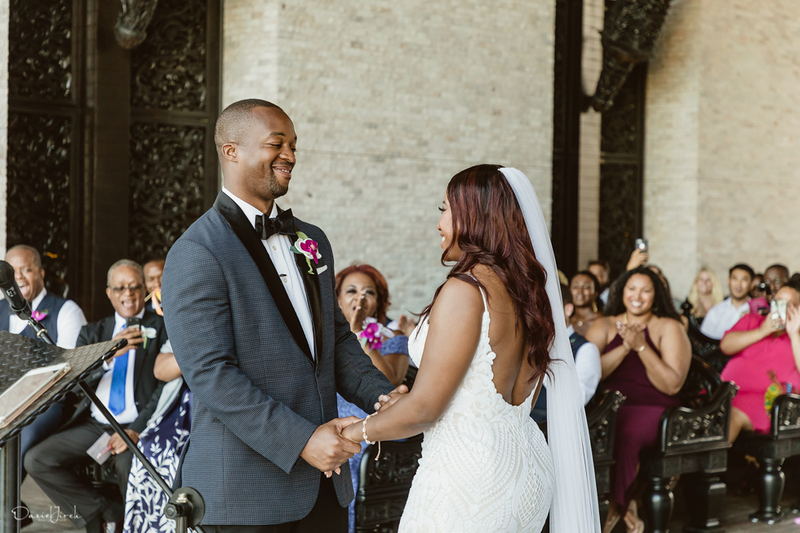 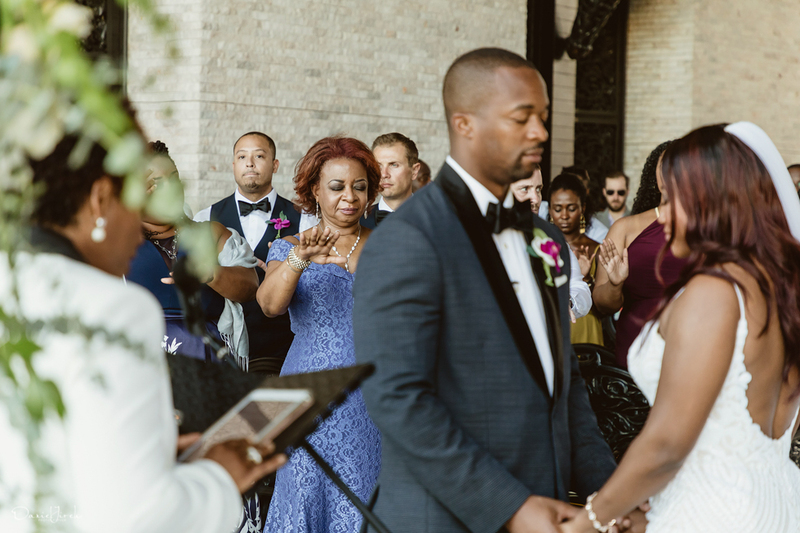 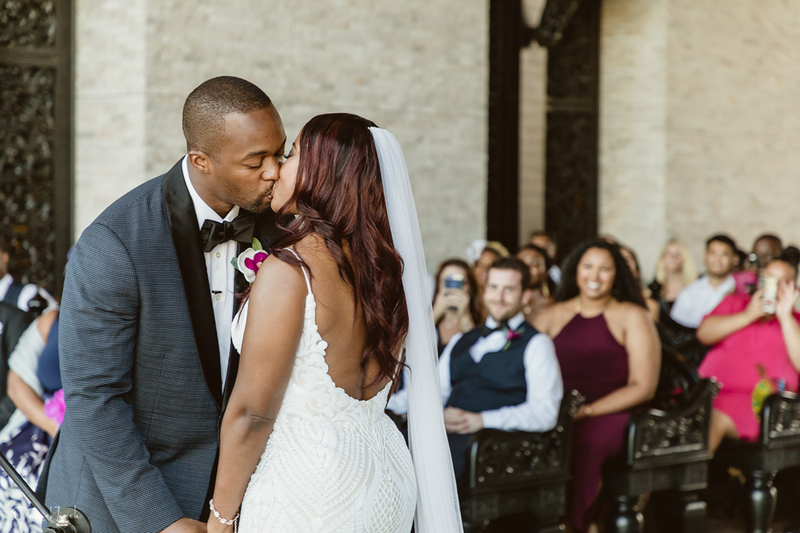 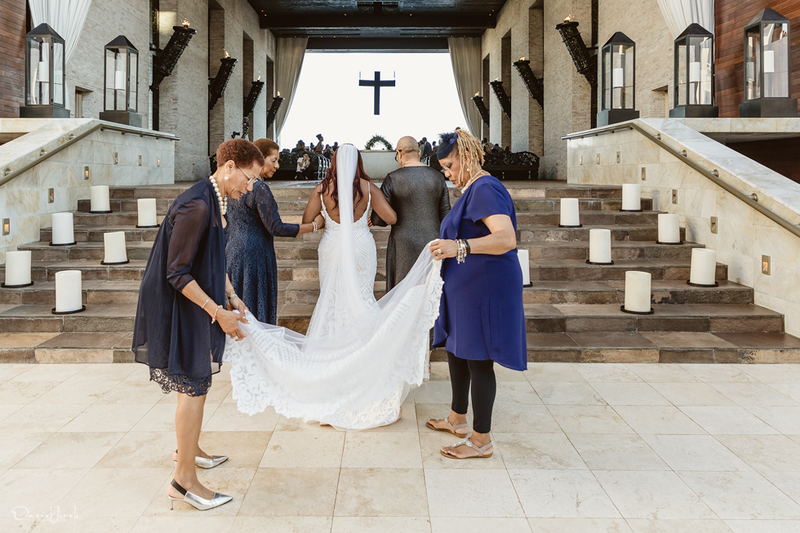 While her bridal party was all things glamorous, Natalie sparkled in her mermaid-cut gown, sweetheart neckline and Cathedral length veil, leaving no doubt as to who would be the star of this show! 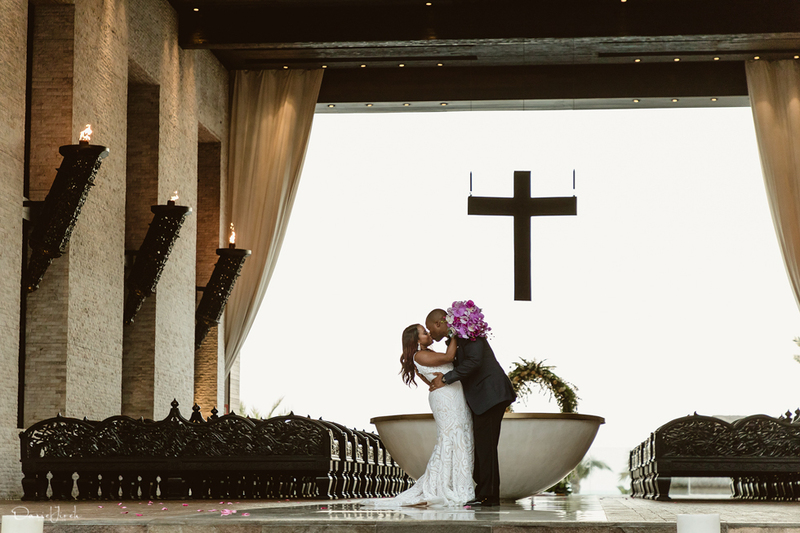 After a private first look, it was time to say I do, and Natalie smiled ear to ear as she entered Cabo Azul’s grand chapel to the intoxicating notes of Cabo violinist Luciano Pavan. 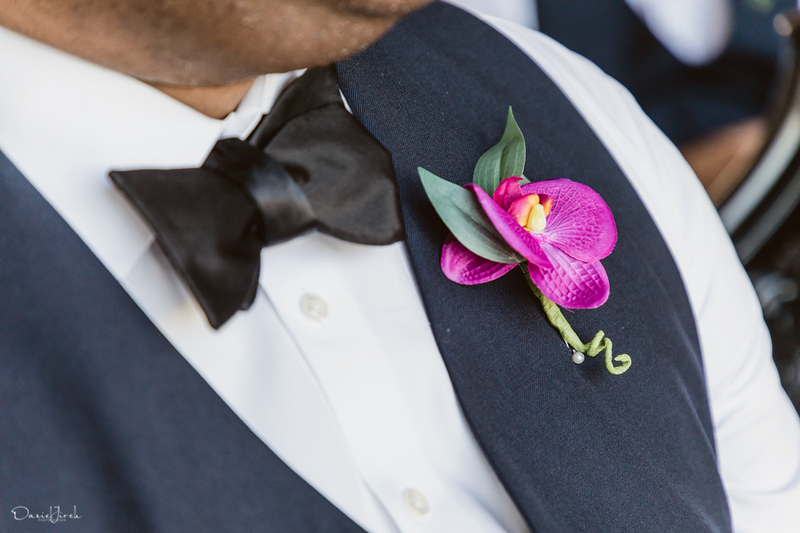 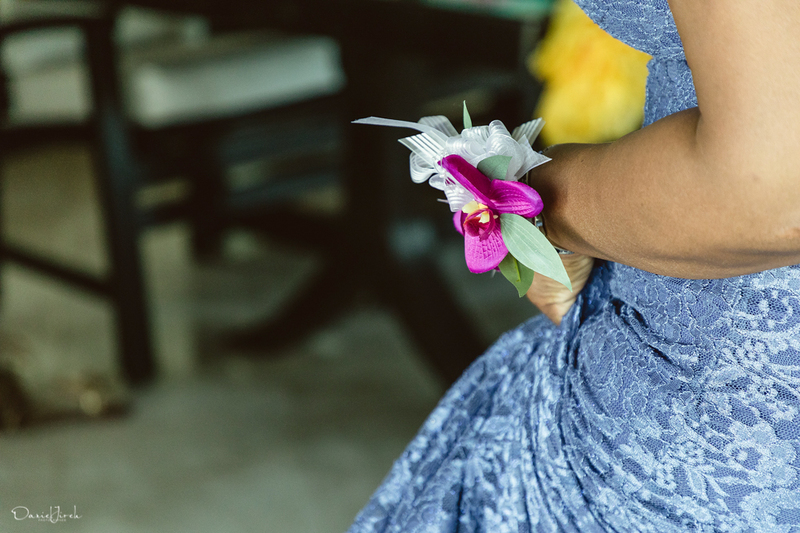 The exotic phalaenopsis lily, a favorite of many the destination bride, dominated the bouquets, and our bride’s fuchsia and white cascade creation a work of art in itself. 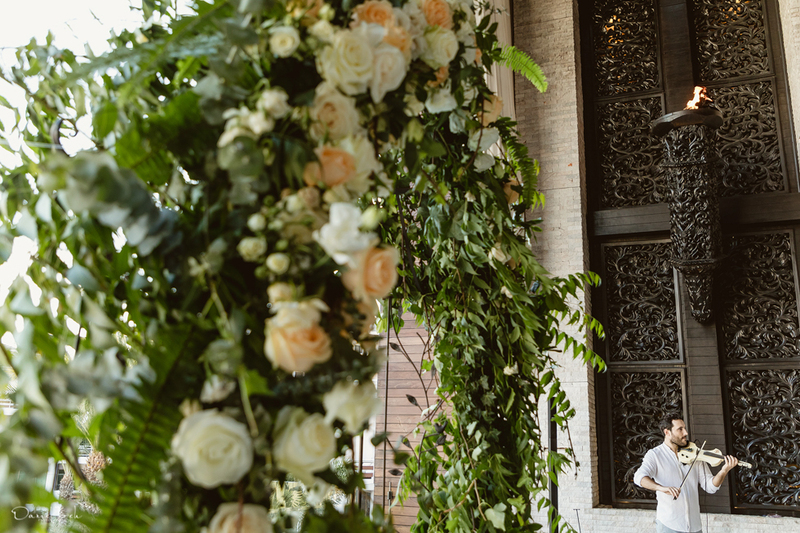 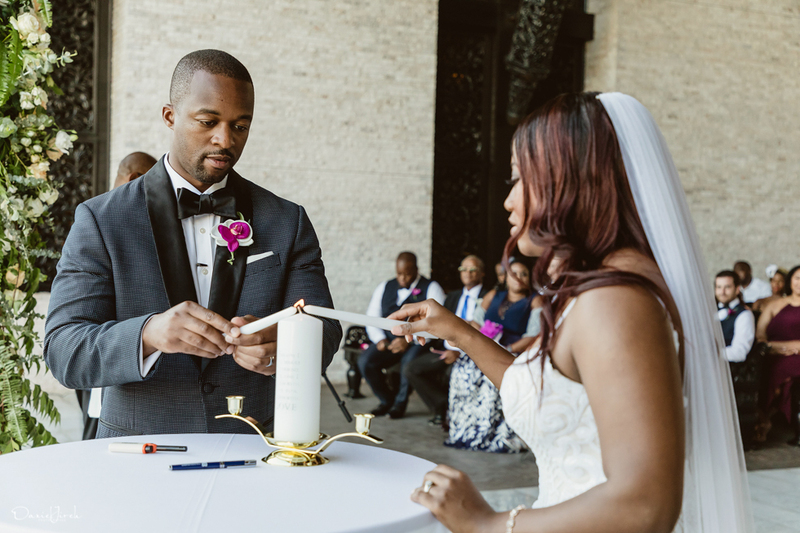 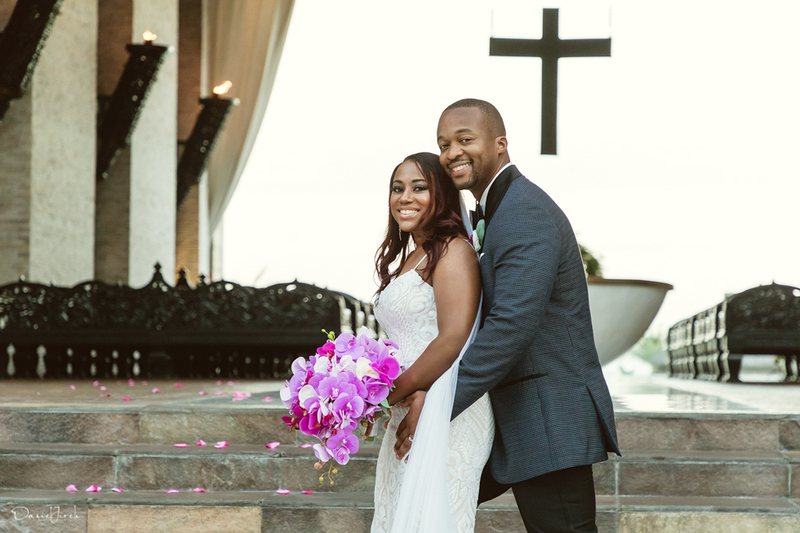 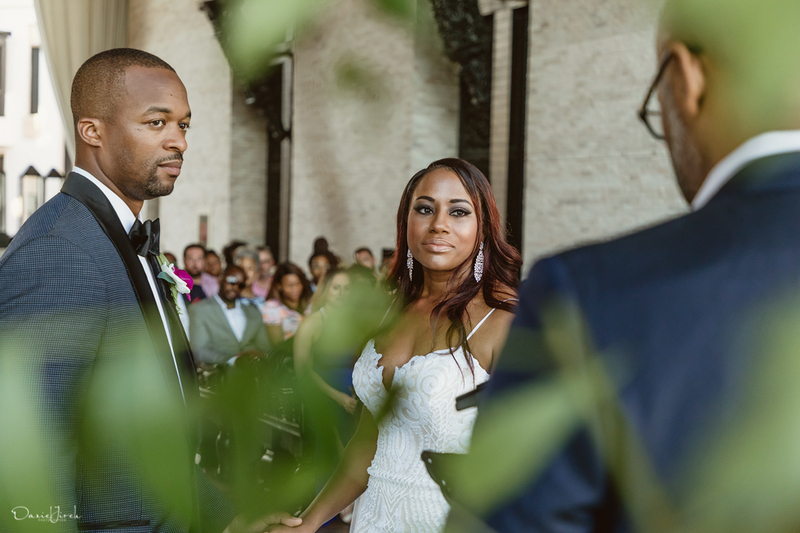 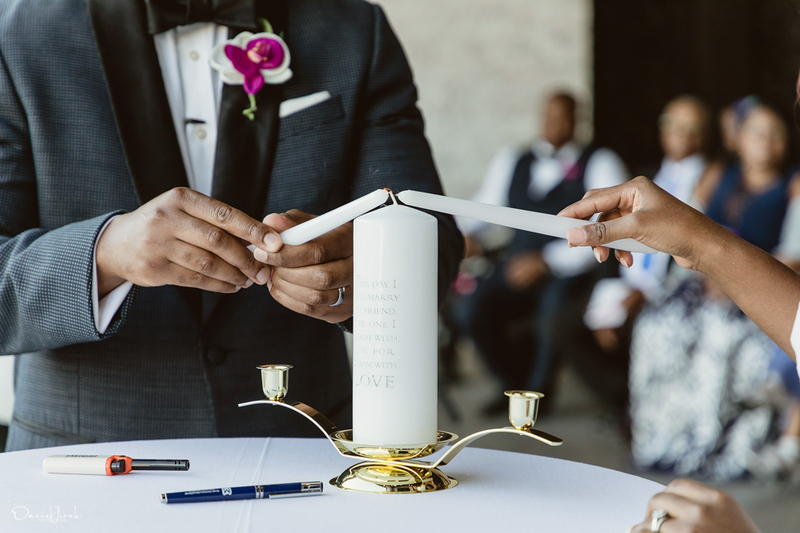 Flowers and Events‘ simple rounded arch of pale roses and soft foliage offset the grandeur of the chapel and focused eyes on our couple, who lit a unity candle to seal their union. 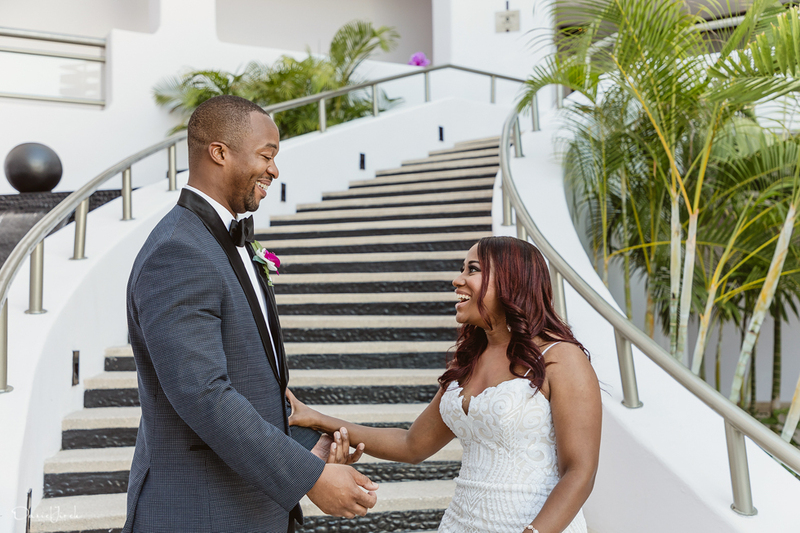 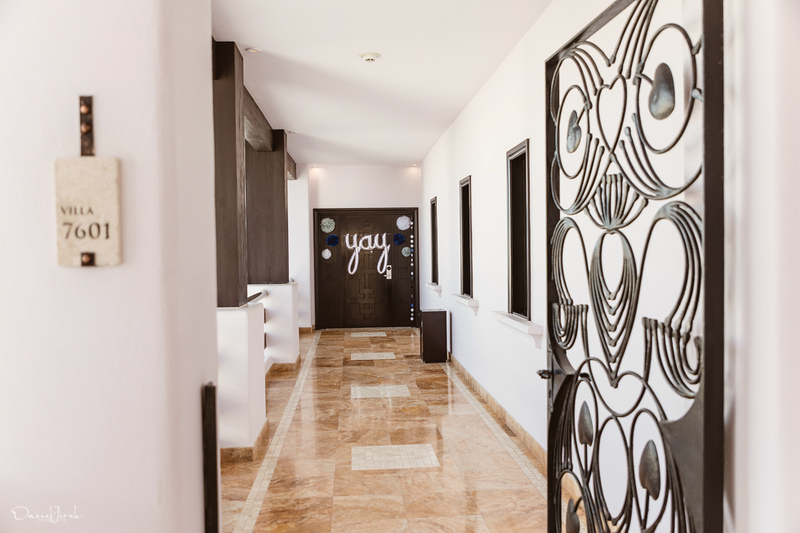 Hungry and ready to get the party started, guests were ushered to Cabo Azul’s Javier’s Restaurant, where they were treated to 5 star dining and impeccable service. 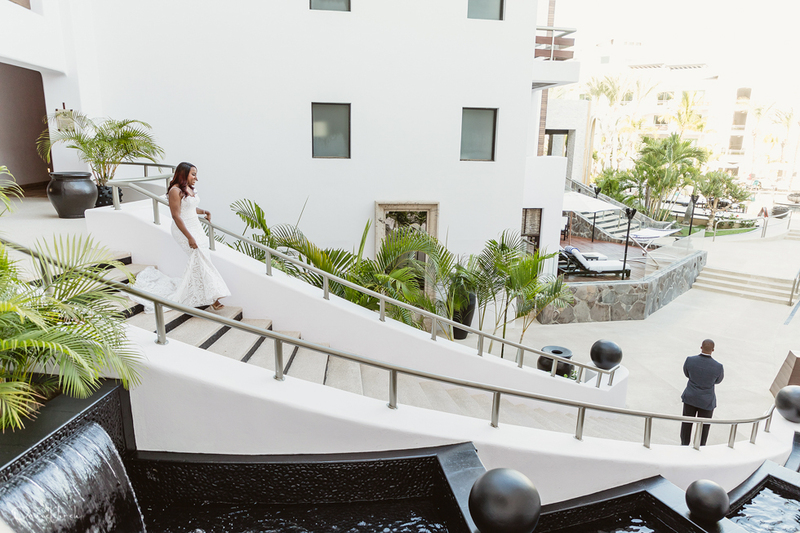 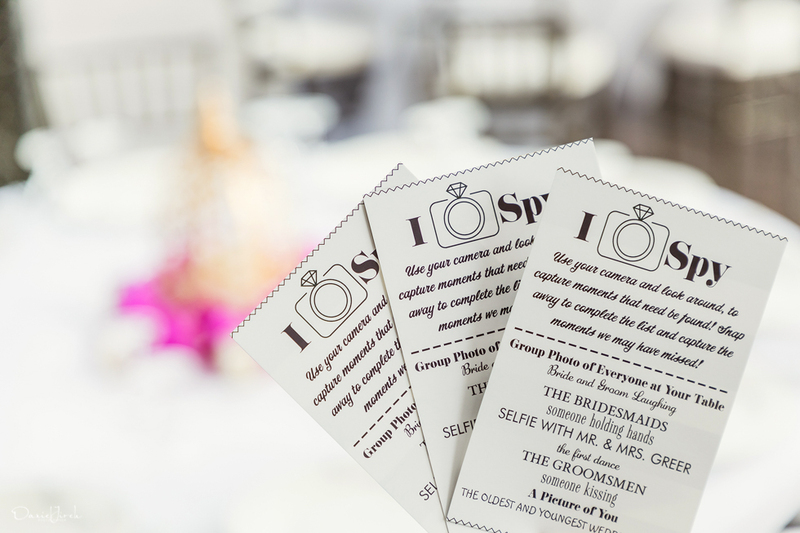 Thoughtful details, such as the couple’s “I Spy” table games, kept guests relaxed and present in the moment, before they were invited to one of Cabo’s trendiest hotspots, Omnia. 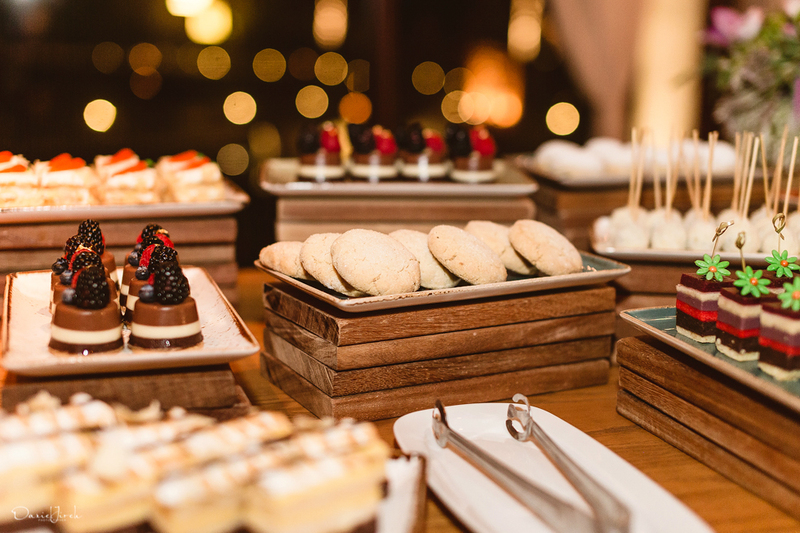 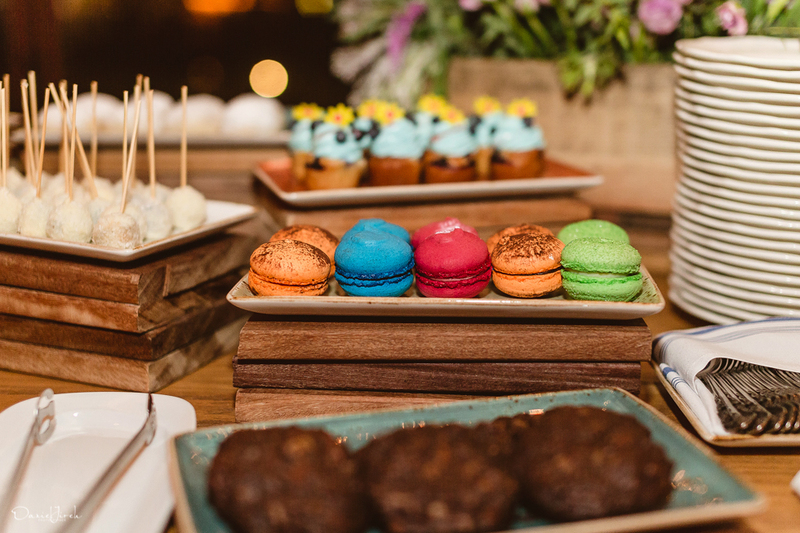 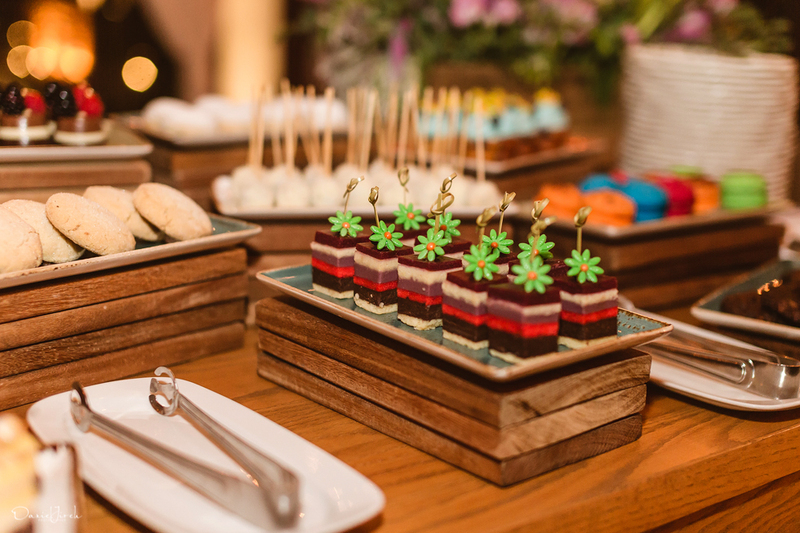 A bright dessert bar of sweet treats was front and center throughout the evening and, never one for the cookie cutter or catalog, Natalie’s scrumptious wedding cake was worthy of more than a few clicks of our shutter. 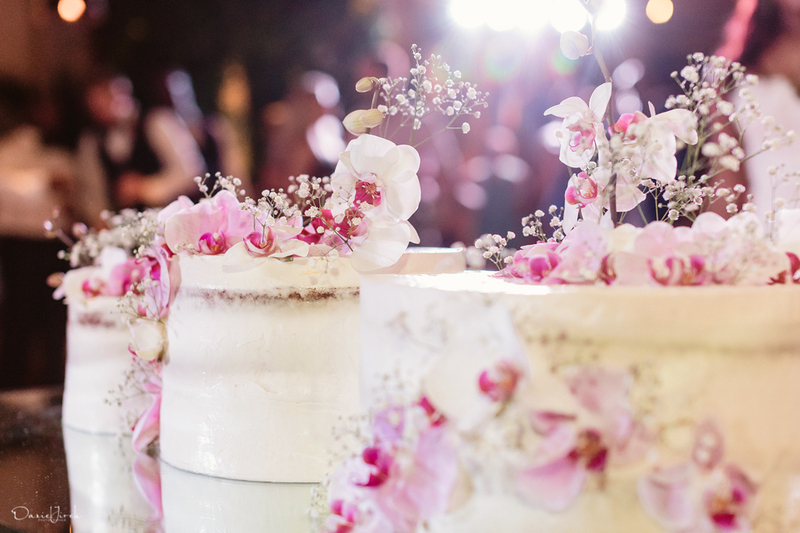 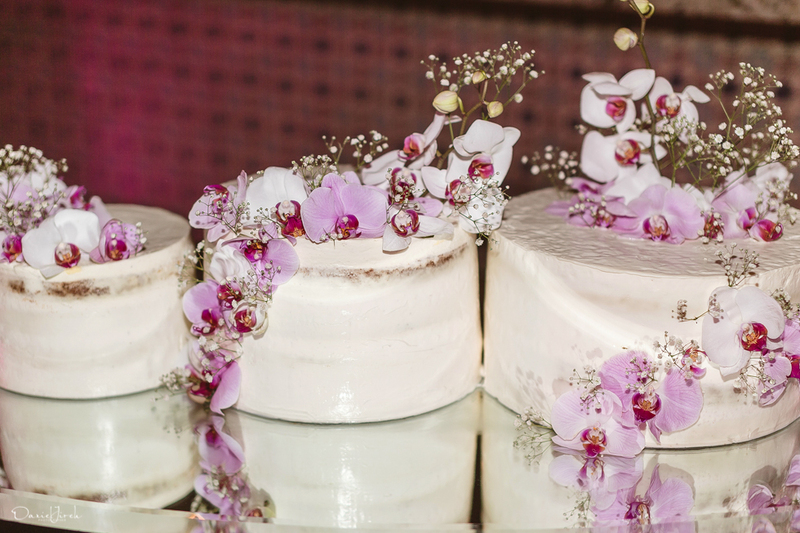 With a slight nod to the popular naked cake trend, the innovative design shunned the traditional, laying 3 tiers side by side on a mirrored base, with a heavy-handed splash of those fantastic phalaenopsis flowers. 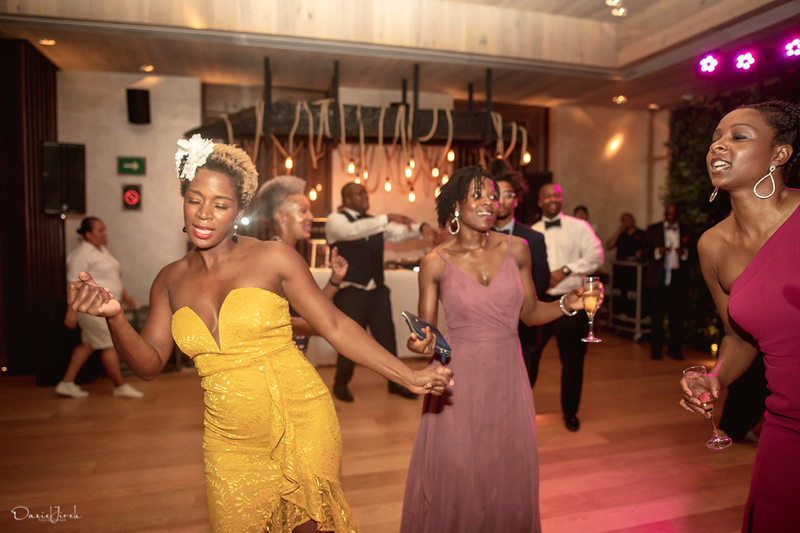 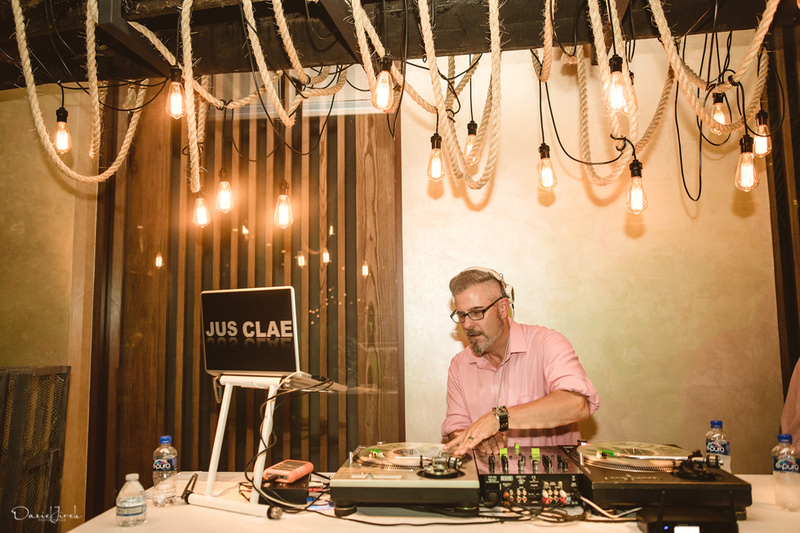 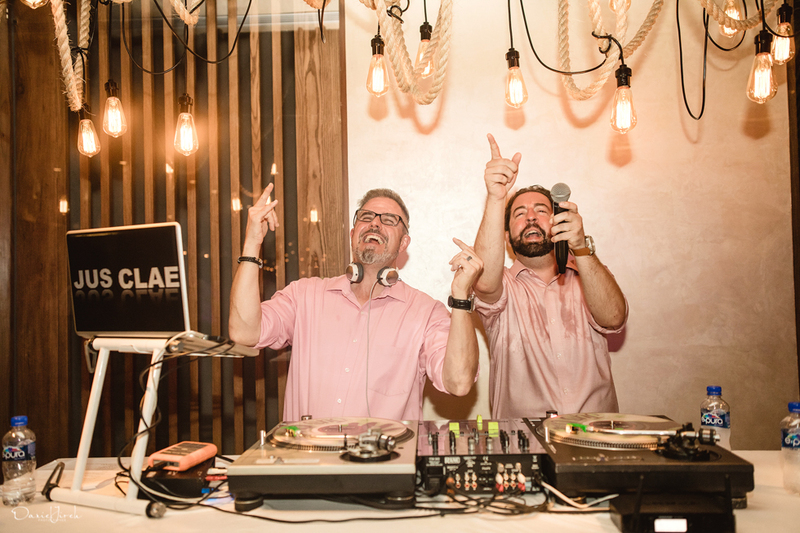 The cutting of the cake marked the last formality of the evening, and it wasn’t long before the jackets and ties came off, with DJ Jus Klae mixing the soundtrack that had the popular party spot popping well into the evening. 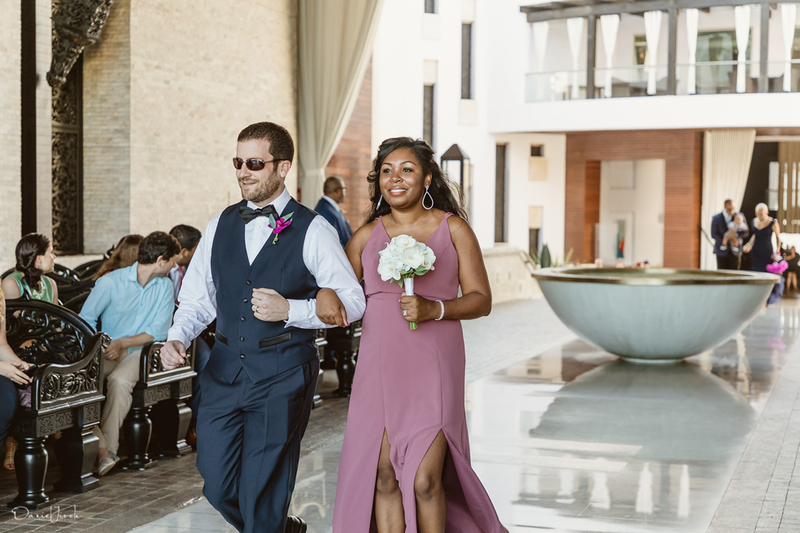 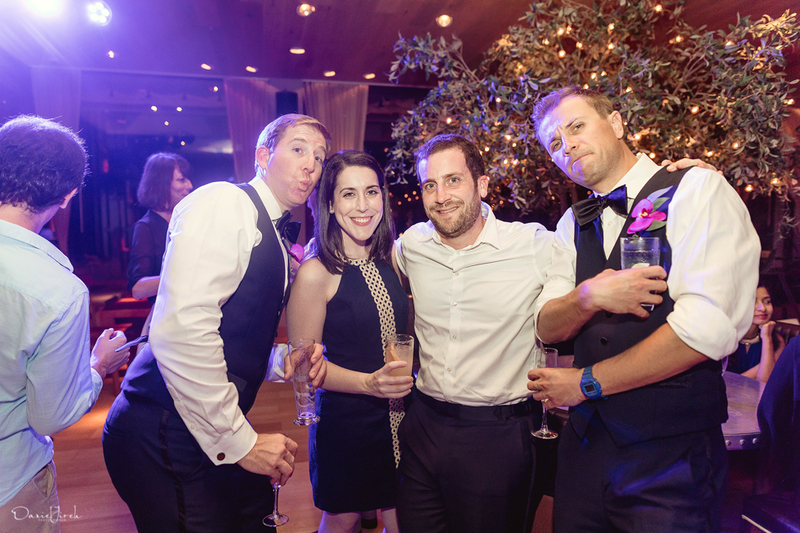 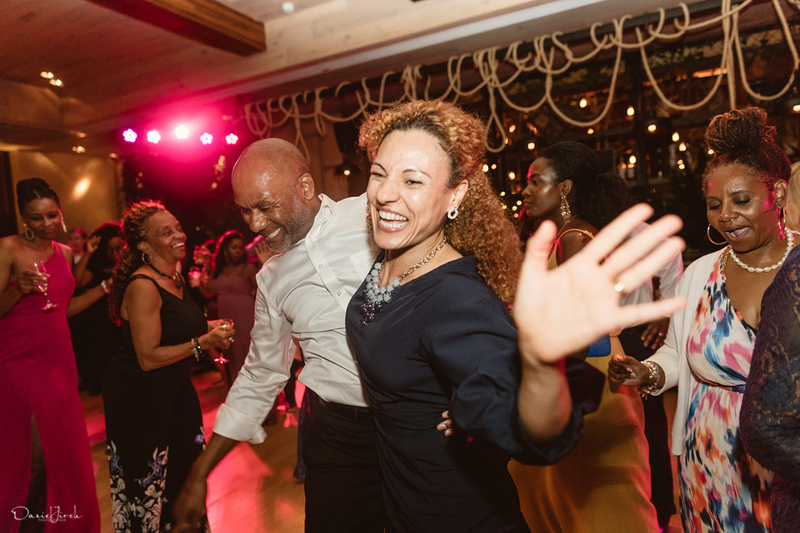 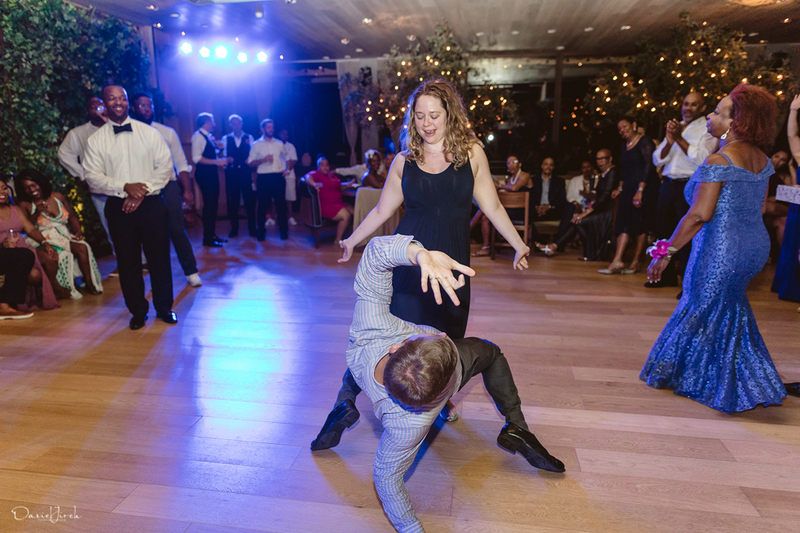 Thank you, Natalie and Brian, for going all out, for having a wonderful bunch of family and friends and, most importantly, for letting us be a part of it!